With Christmas and New Year out the way many people’s thoughts turn to where to go on holiday (with us all getting bombarded by incessant holiday adverts on the TV at the moment). 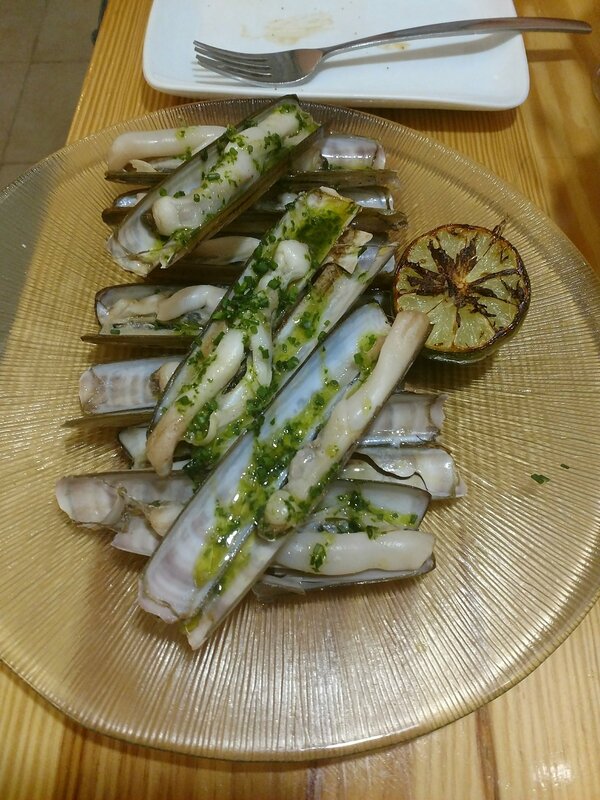 Regular readers will know of my enduring love of the pintxos scene in Pais Vasco and, particularly, Donostia San Sebastián (have already booked hols in June there), but another Spanish city that has been on my radar for some time (on the food front) is Sevilla where tapas reigns supreme. A much needed break to Sevilla and Cadiz (unbelievably it topped 38°c – 100°f in old money) in October when we were in Sevilla (it has taken me a while to write this one up as kept on adding) gave Mrs. SF and I the chance to eat and drink in some of the city’s famed tapas bars while basking in the heat (or in my case basting). 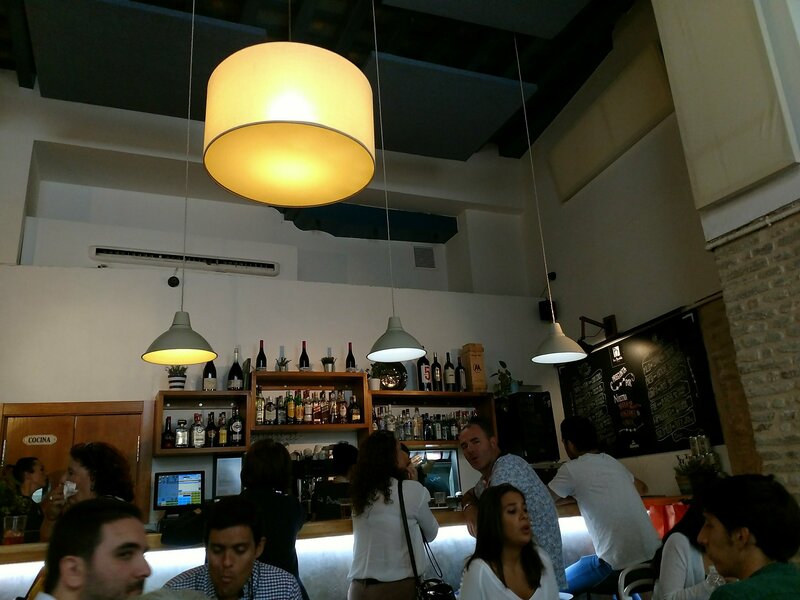 The bars here are a mix of traditional and more experimental so pretty much cater for all tastes. 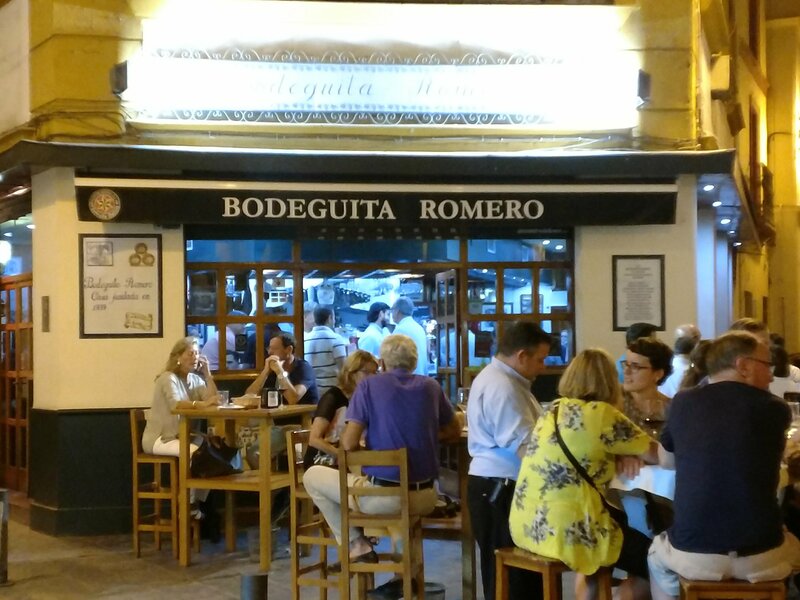 By no means a definitive list, or even anything like the best of (as we barely scratched the surface of Sevilla) below are simply some of the places (food and drink wise) that Mrs. SF and I enjoyed during our visit. 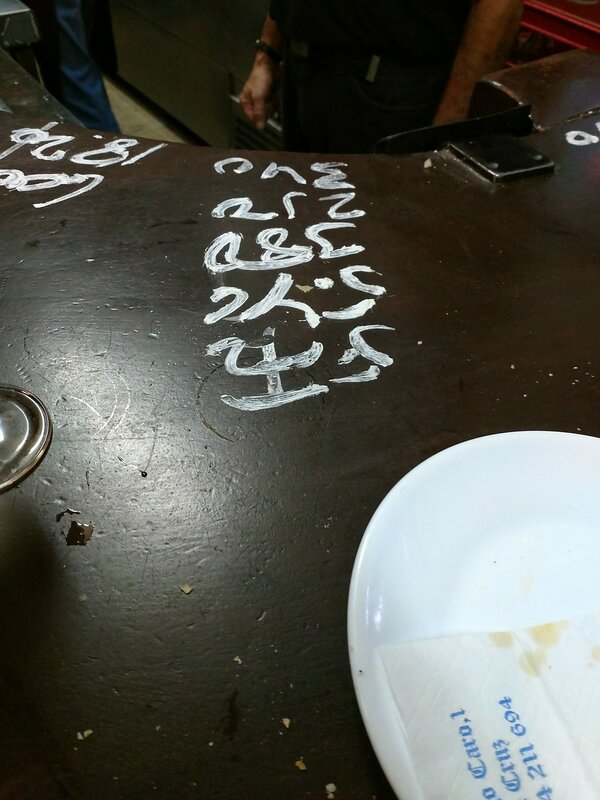 A bar that was recommended to me and a very good call it was too. 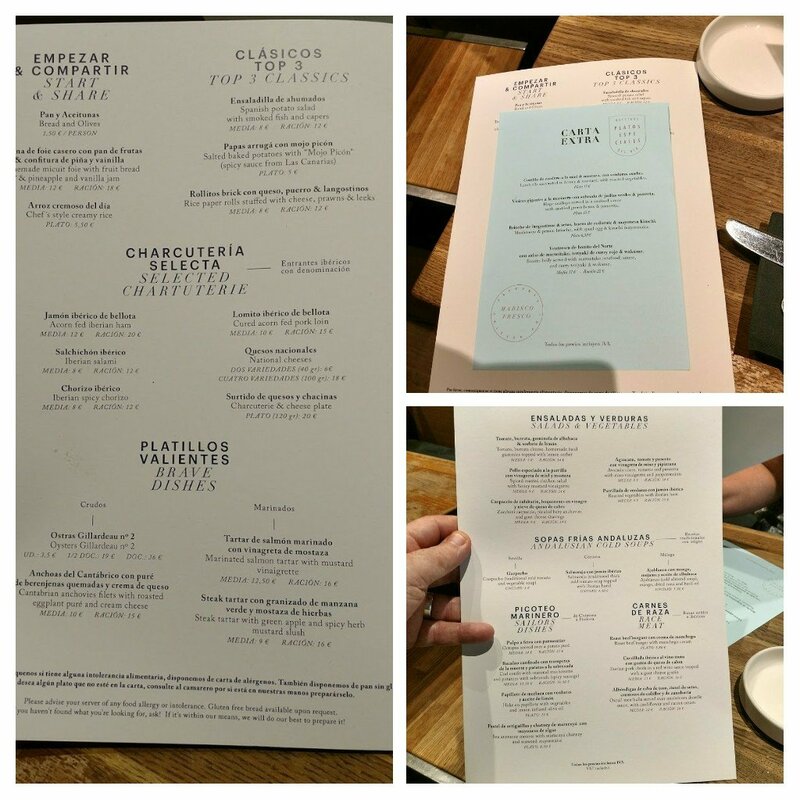 Nice drinks selection here also and very engaging staff. was a bargain €4.50 (just have a look at the retail prices in the UK to see how good a price that is) and drink were also very cheap. 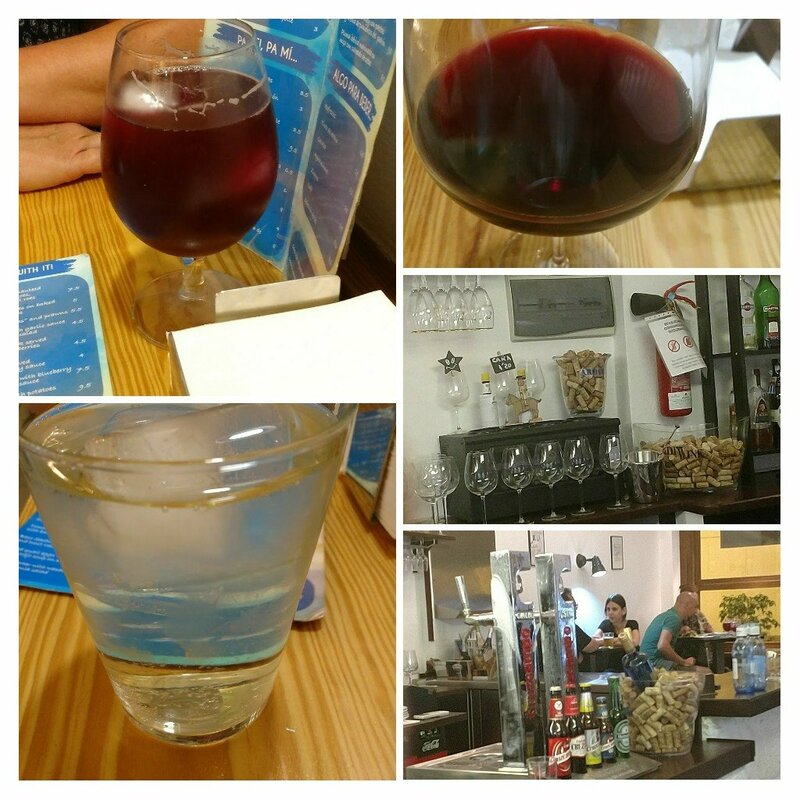 Beer €1.20, tinto verano €1.50, rebujitos €3 (all very refreshing in the blistering heat of Sevilla) and a very decent glass of rioja a mere €2.50. 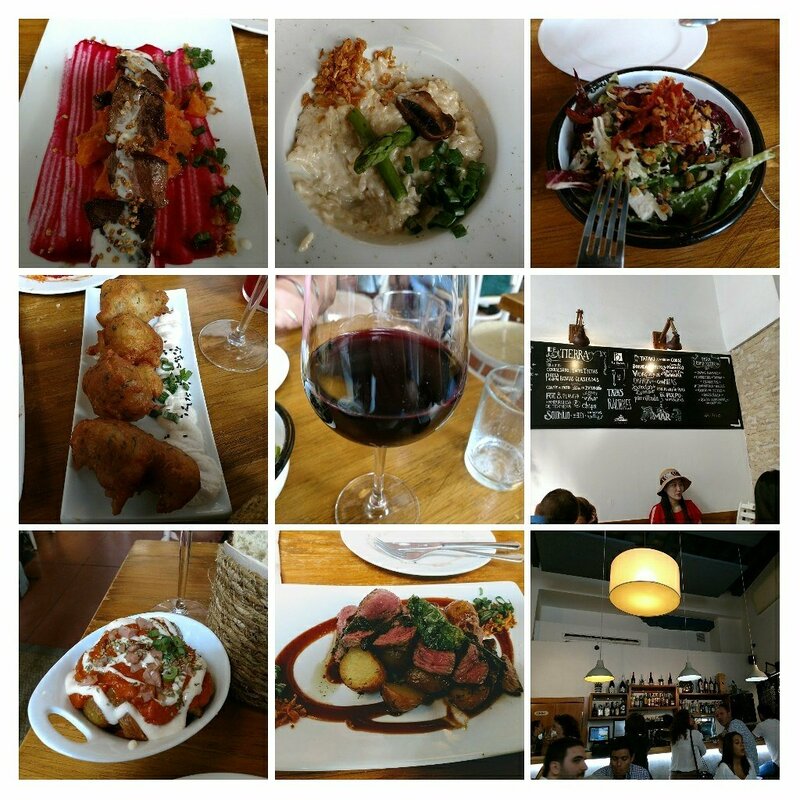 We visited several times as it had good food, good booze and a nice vibe. 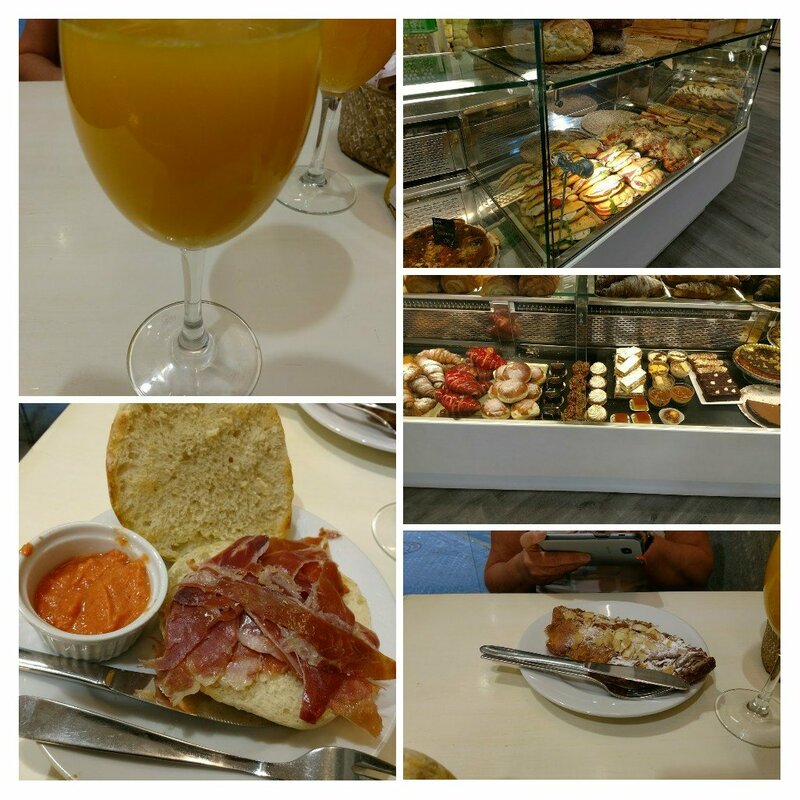 What I would call a classic tapas bar, with the focus on cured meats and cheeses and montaditos (tapas sized filled rolls) – for which there was an awesomely efficient production line is plan sight. 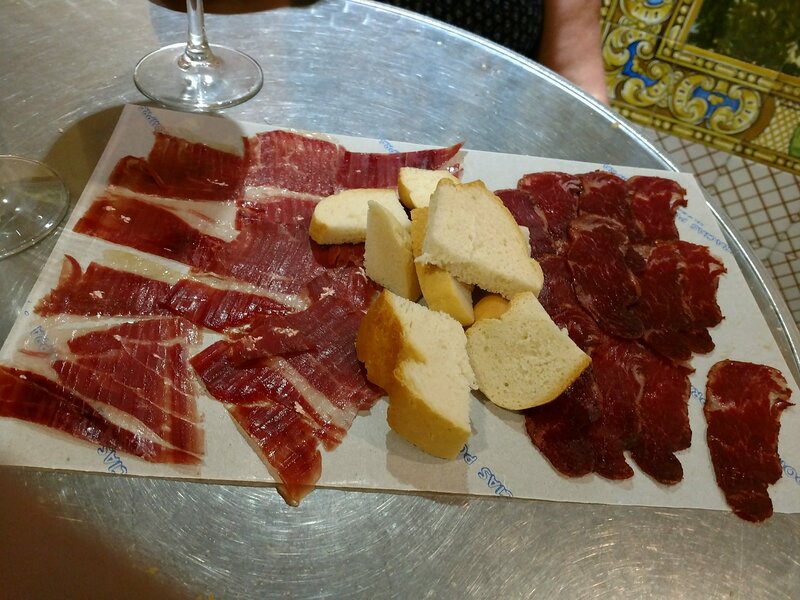 What drew me in, however, was the fabulous La Rioja Alta wines on offer in this place, which complimented the great cured meats and cheeses perfectly. 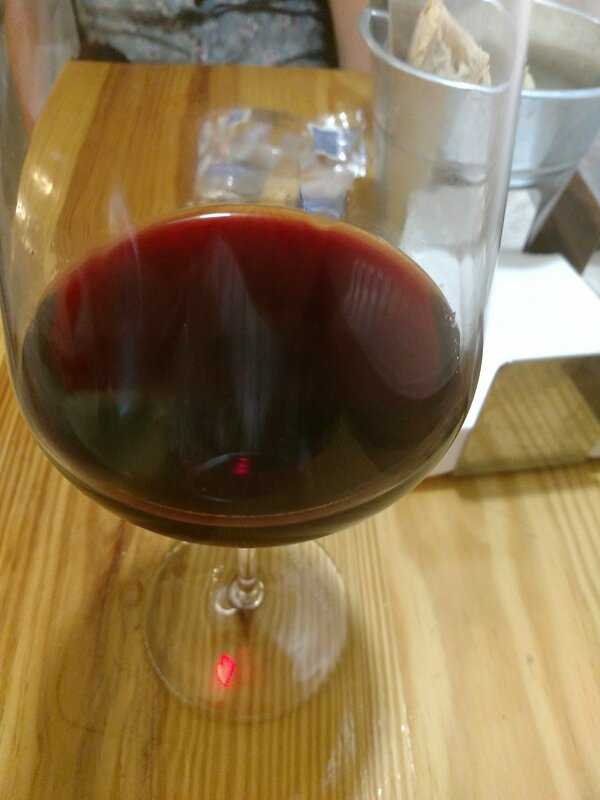 A bottle of Vina Ardanza (an absolutely cracking Rioja from Bodegas La Rioja Alta) was an unbelievable €20 for a full bottle and €3.50 for a generous glass (talking about £20+ UK retail and in a bar/ restaurant £55+). 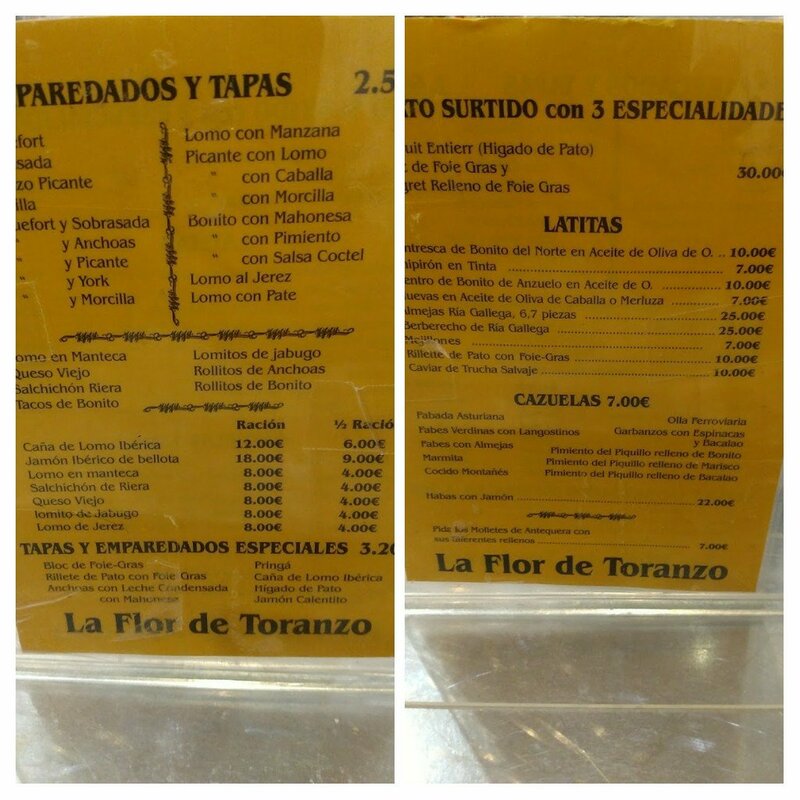 Food prices were also very reasonable (top quality cured meats are never cheap in Spain- but still very good value compared to UK price). 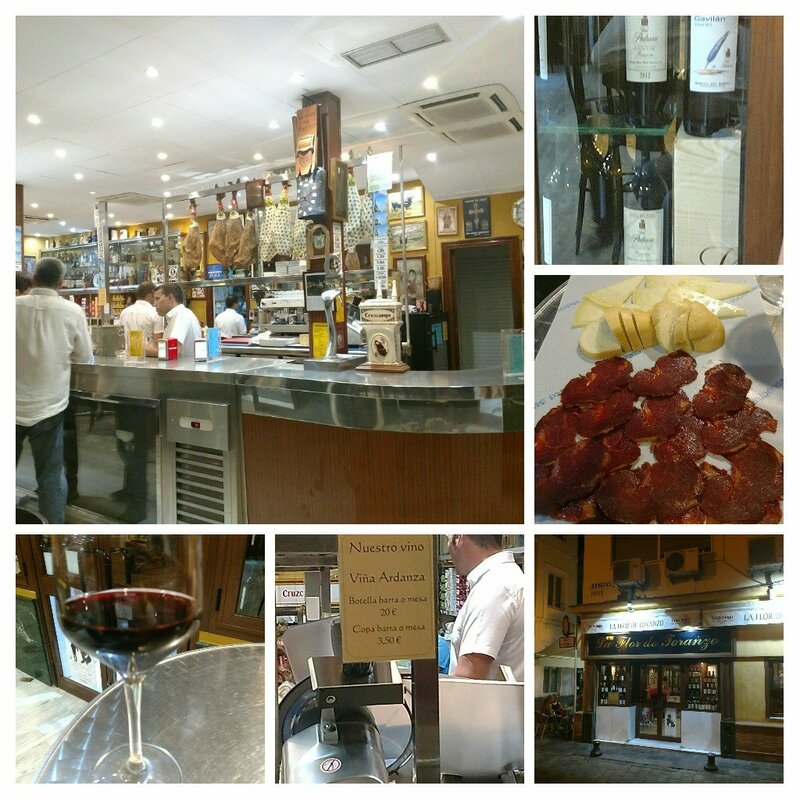 A great place if you love the traditional Spanish cured meats and Rioja (I do in spades). Nice also to see chilled fino on draft at the bar. Now that is something I would love in the UK. 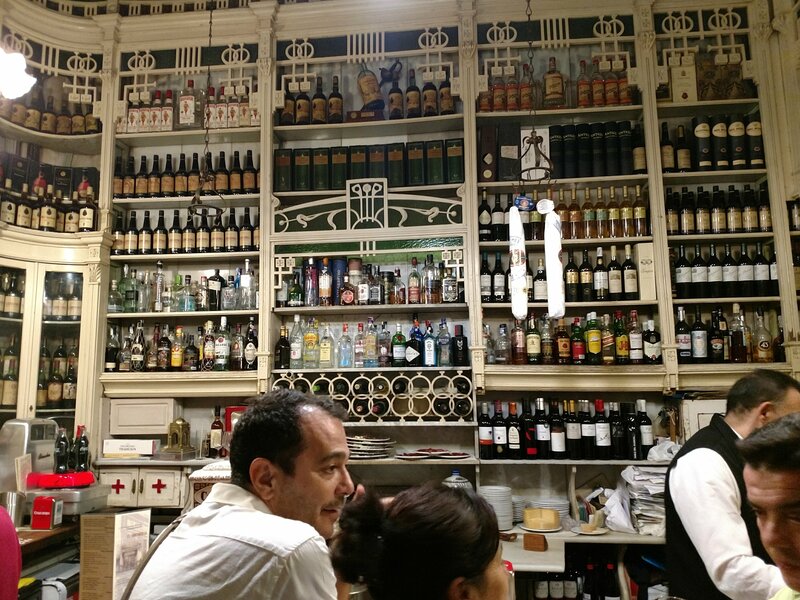 They have a great selection of booze on offer to cater for all tastes and excel on the sherry, red and white wine front. 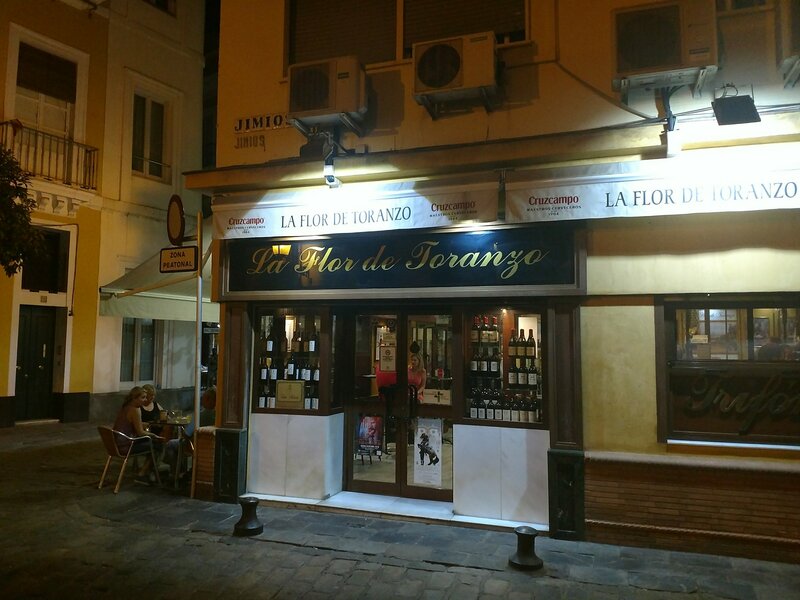 A must visit place if in Sevilla and part of a very fertile tapas strip (walk 30 yards and you will fall into La Flor de Toranzo, another 100 yards and you are outside El Puntal and then the many bars of Calle Zaragoza. 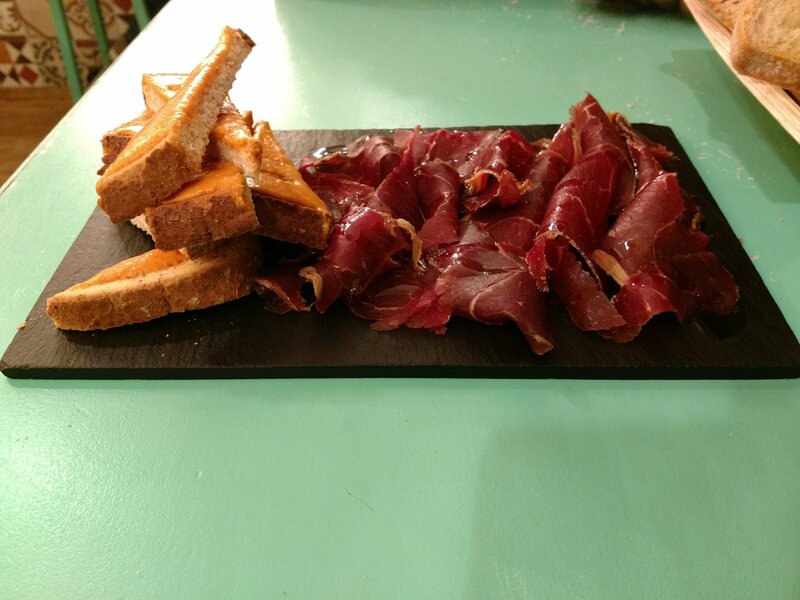 A tiny gem of a bar, which has a lovely selection of food to feast on. 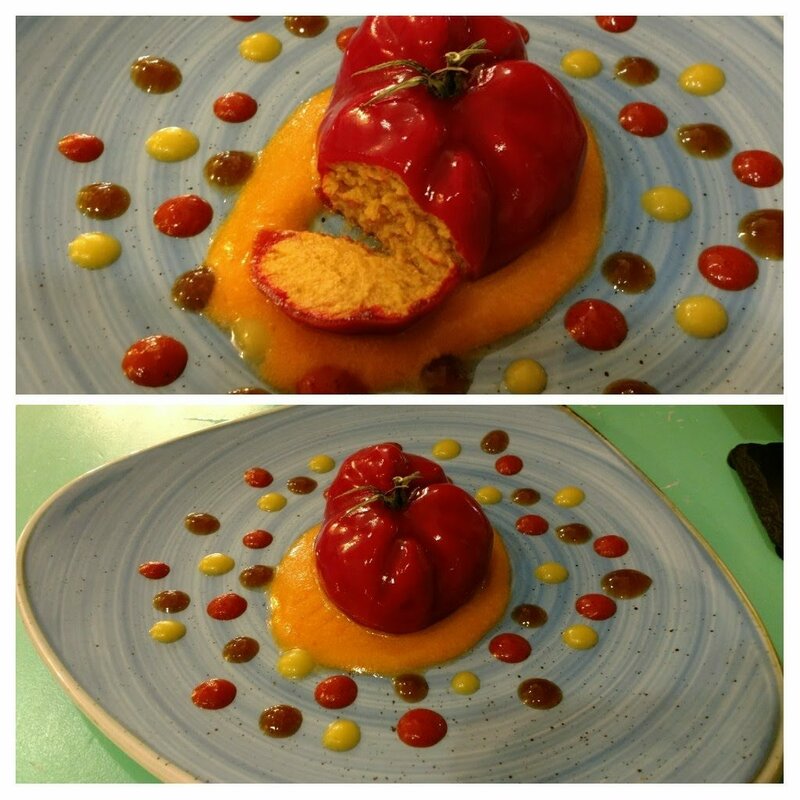 and more inventive stuff like their Tuna Tomato (a glorious tomato glazed tuna pate). 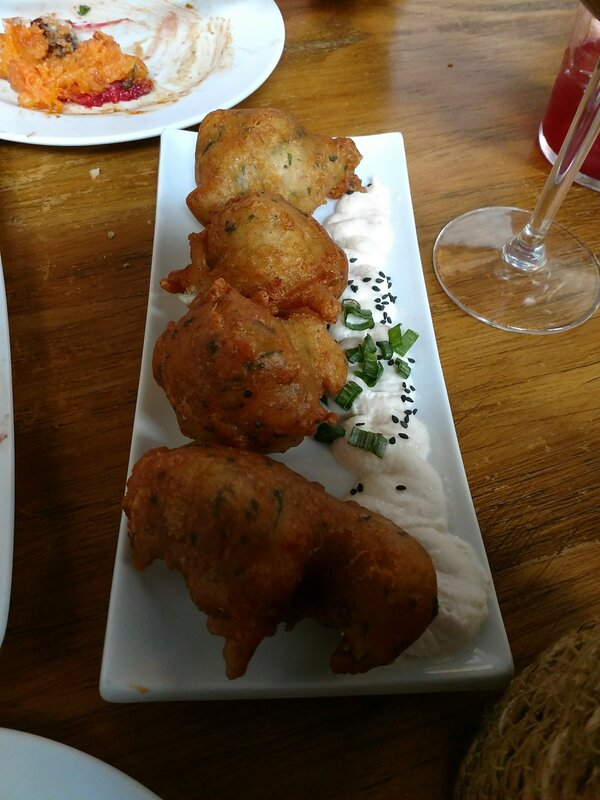 Pretty as a picture, equally as tasty, and a steal at €4 (easily enough for two). Whilst the food here is really good, the real draw is the booze. 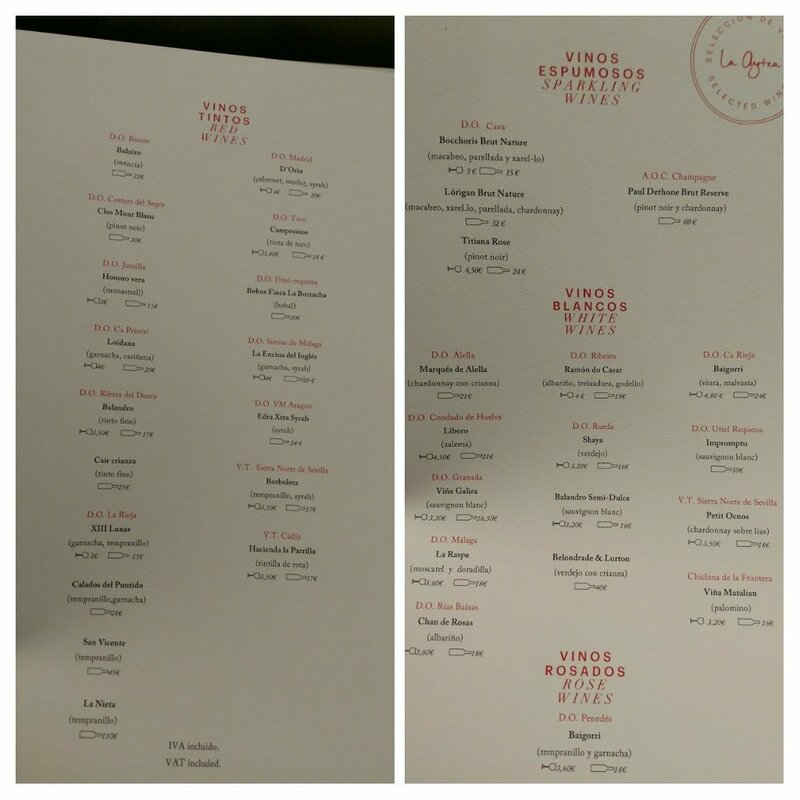 They have a sherry list to die for, as well as some very interesting other red and white wines. All are priced incredibly reasonably. 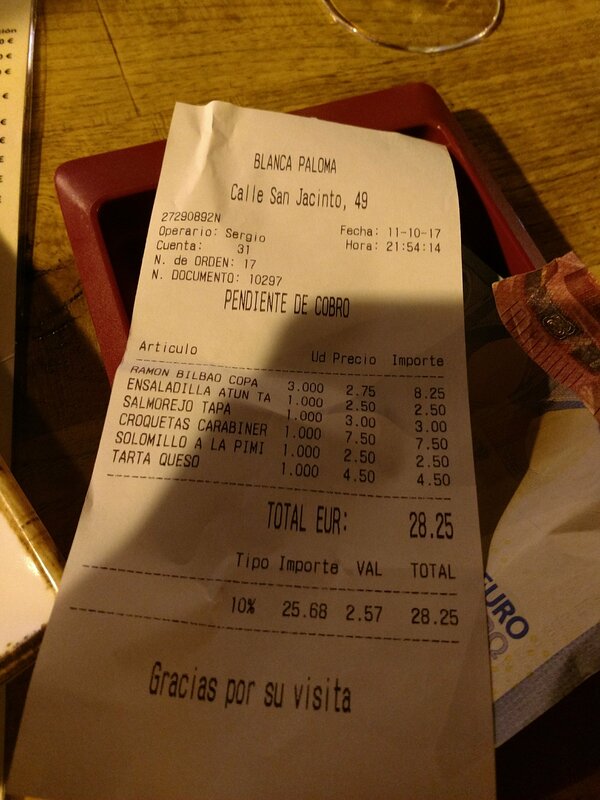 I blew out a bit and had a Fernando de Castilla Antique Palo Cortado at €8 a glass for a very generous pour. 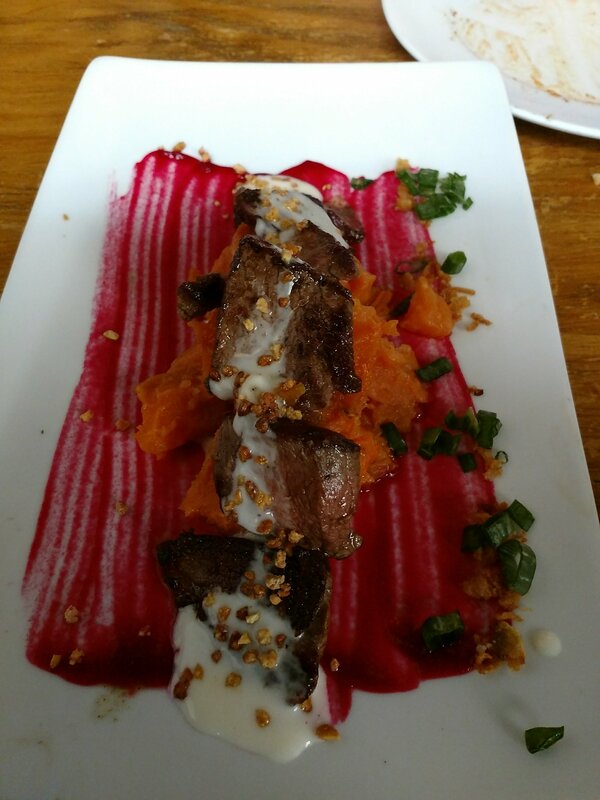 Stunningly good stuff. 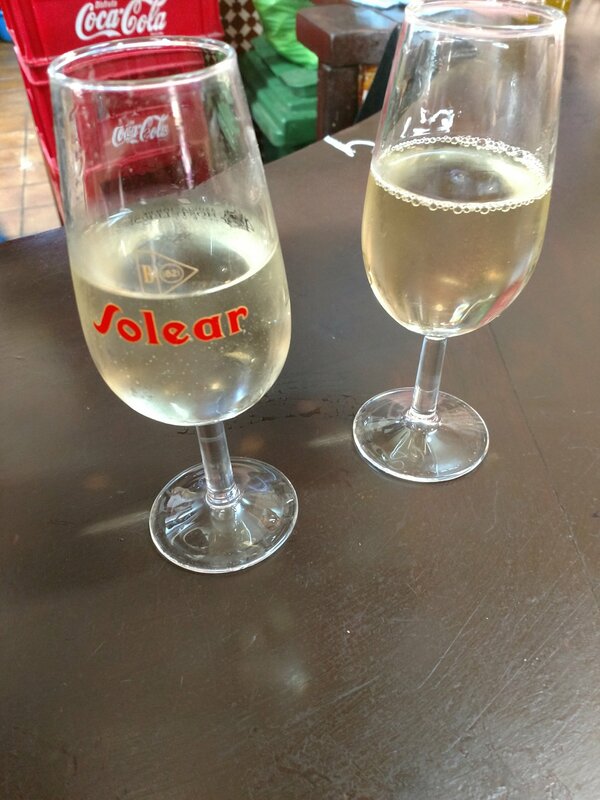 With the cecina, we had two glasses of a rather interesting (in a good way) Andulucian red (real quality starting to come out of this region on the red front) from Ronda (La Encina de Inglés – which seemed apt) for a mere €3 per glass. Very friendly and knowledgeable staff are on hand to help with your choices. My advice is get there early to bag a seat and enjoy some fab wines (particularly the sherries). They seem to generally only open in the evening. 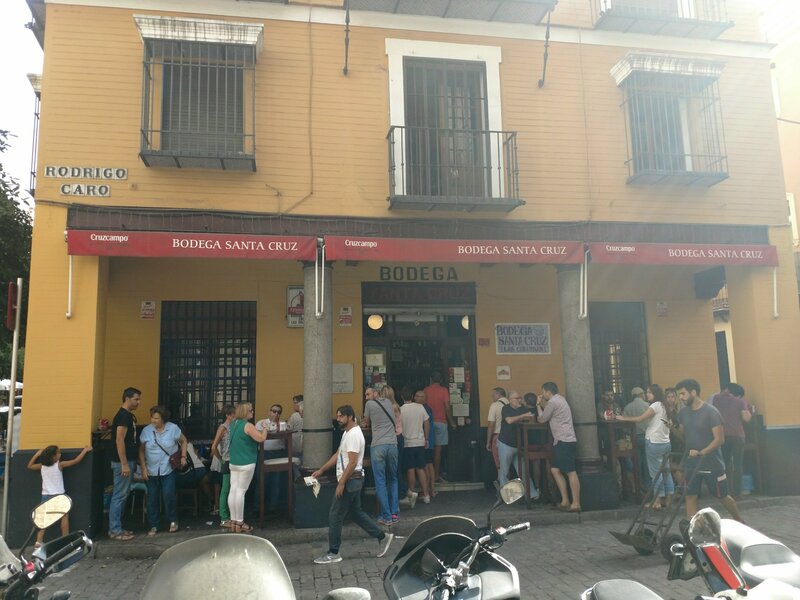 A legendary bar on the Sevilla food scene and one that is recommended by all the guide books (and as result it is very popular). 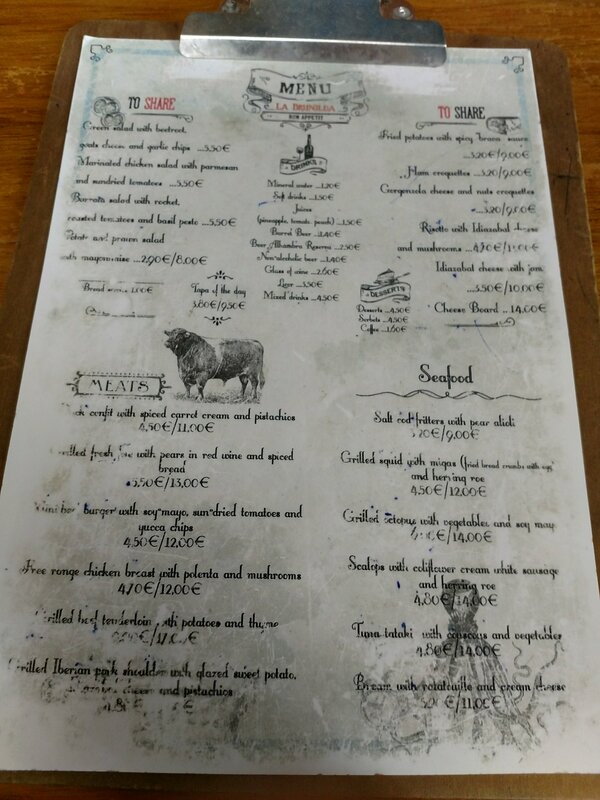 At peak times there is always a queue (often around the block) to get a table, but we got lucky at 14.30 mid week and walked in and bagged a table immediately. 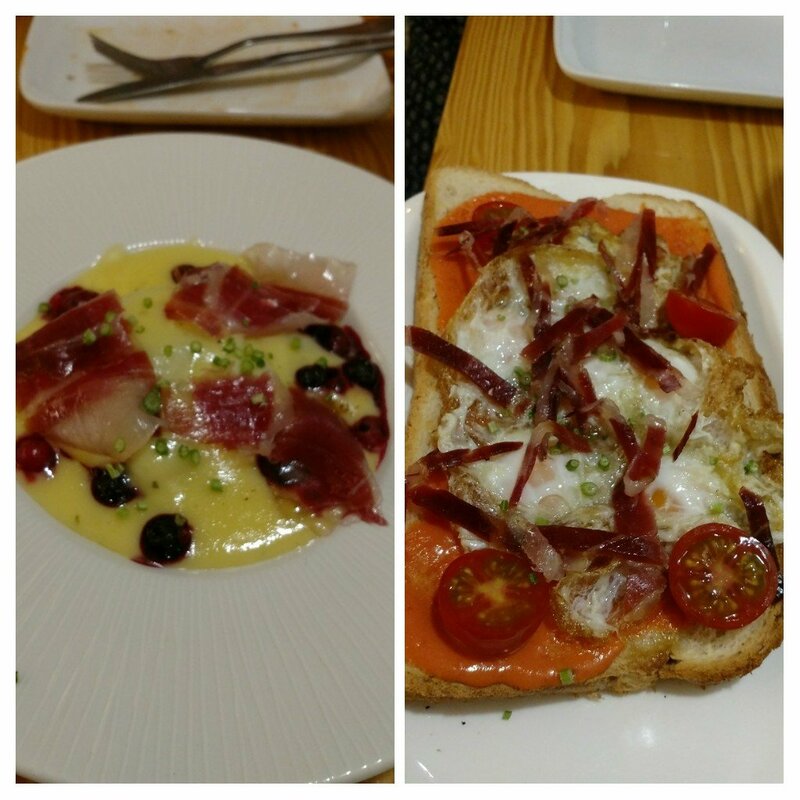 Portions are large and we found the tapas generally more than big enough to share. 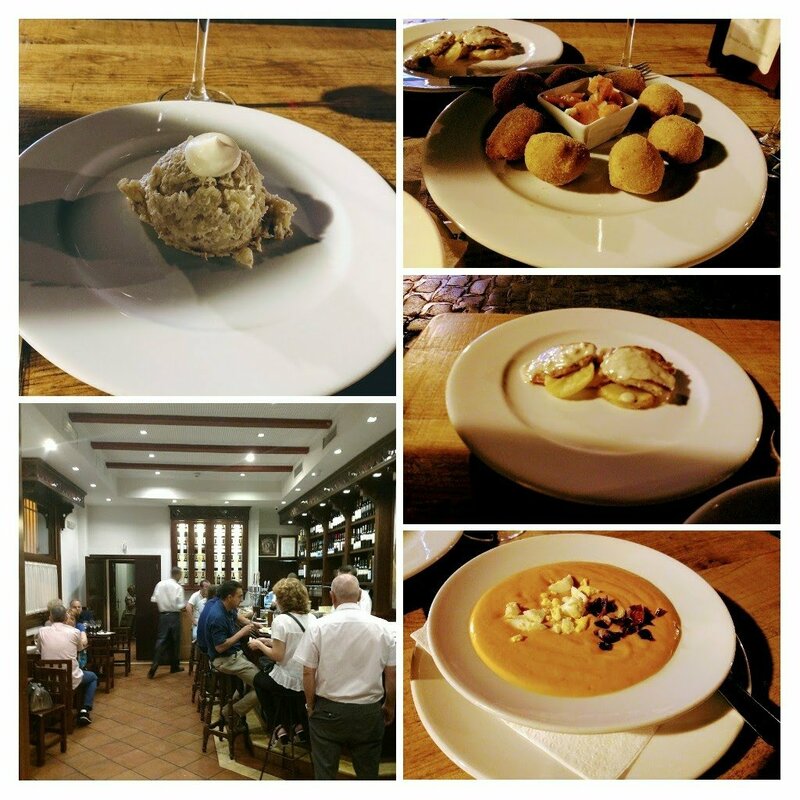 This place offers top class cooking and is up there with the very best in Donostia San Sebastián. Great value for money for the quality of what we got I thought. 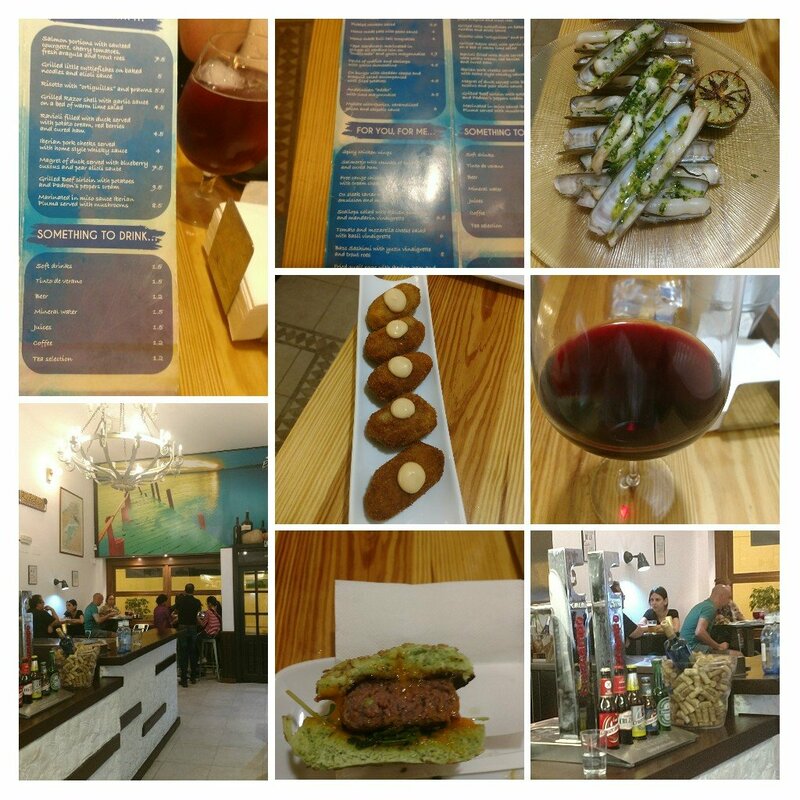 My only regret was I failed to order their legendary “crack” burger (one is never enough it seems), an omission that was met with utter disbelief by Shawn Hennessy (who I believe named it as such) of Sevilla Tapas Tour in response to a tweet by me at the time about my visit. Next time 😀. and added to as you inevitable order more and more. 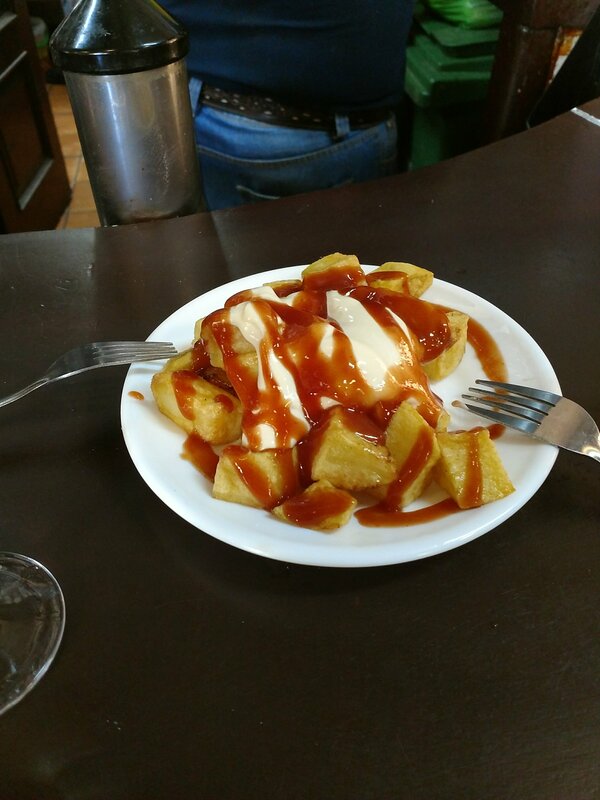 Other delights (very nice pringas and flaminquins) were seemingly for mere pennies. 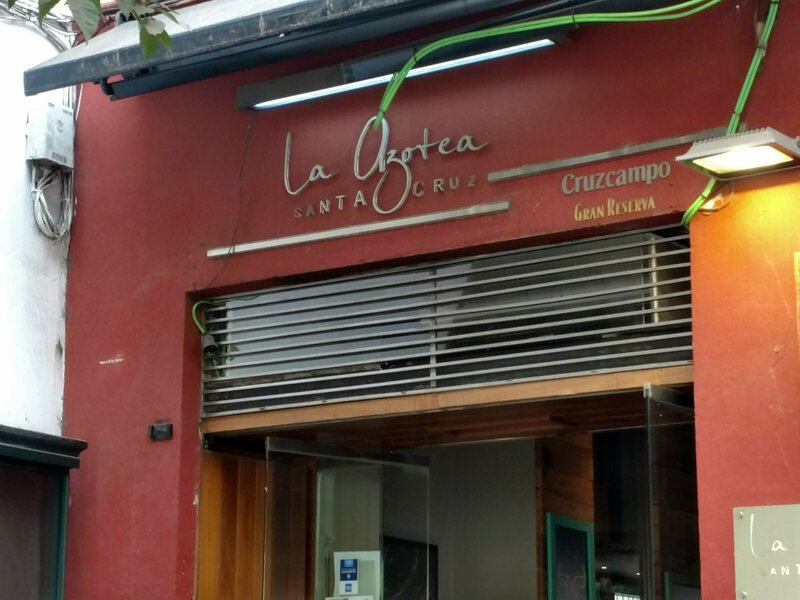 Not sophisticated, but a really lovely place and very good value. Bar staff are real characters (with a phenomenal work rate – tired me out just watching them). 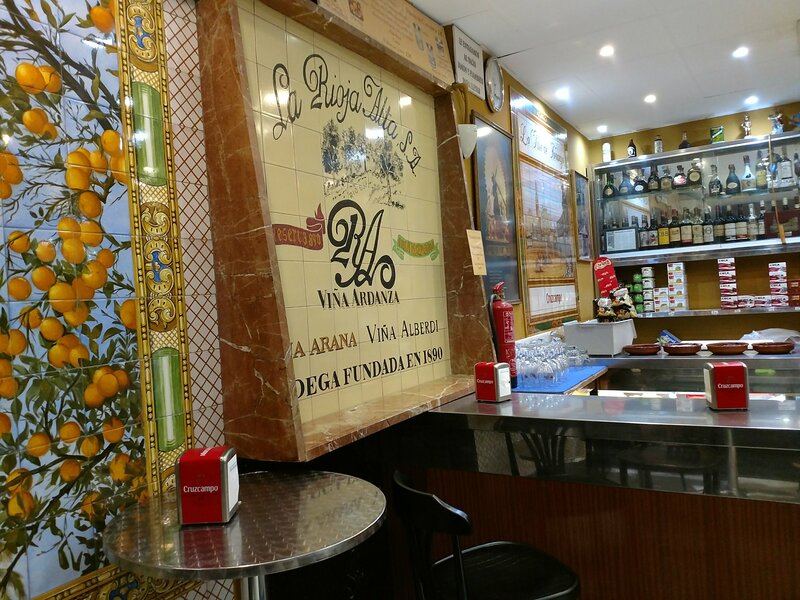 This place was a regular haunt for us (very close to both the cathedral and the Alcazar and on our route to and from our apartment). Quite a modern place, with a trendy vibe to it. 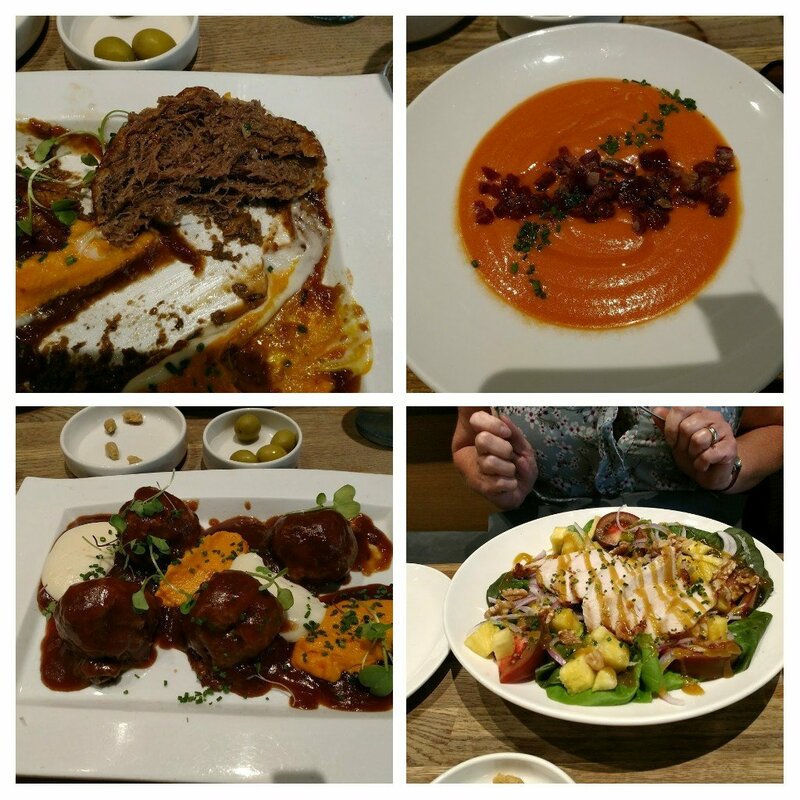 Food on offer was more sit down, substantial, stuff than propping up the bar tapas (although they do have the latter too). We fancied something a bit more substantial one lunch time and, looking at the menu, this place fitted the bill nicely. 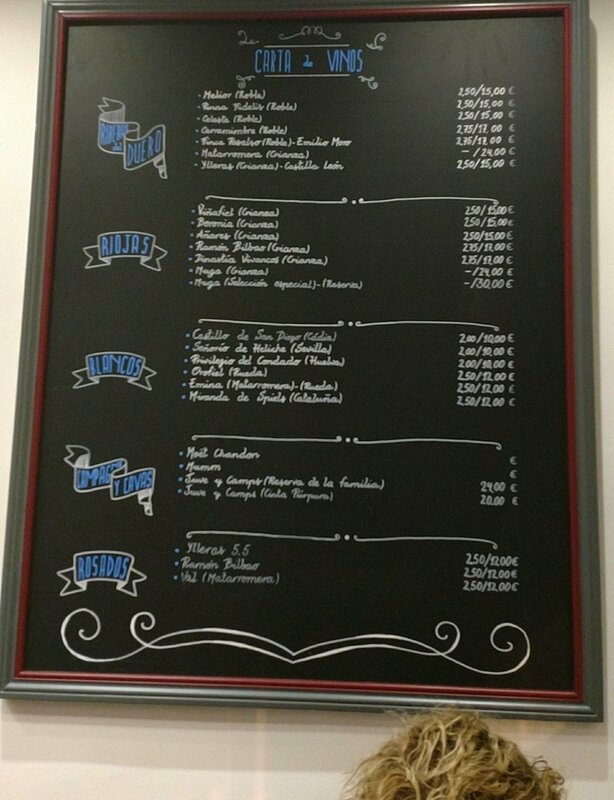 Decent wine list (if an extra couple of Euros more than other places we visited). 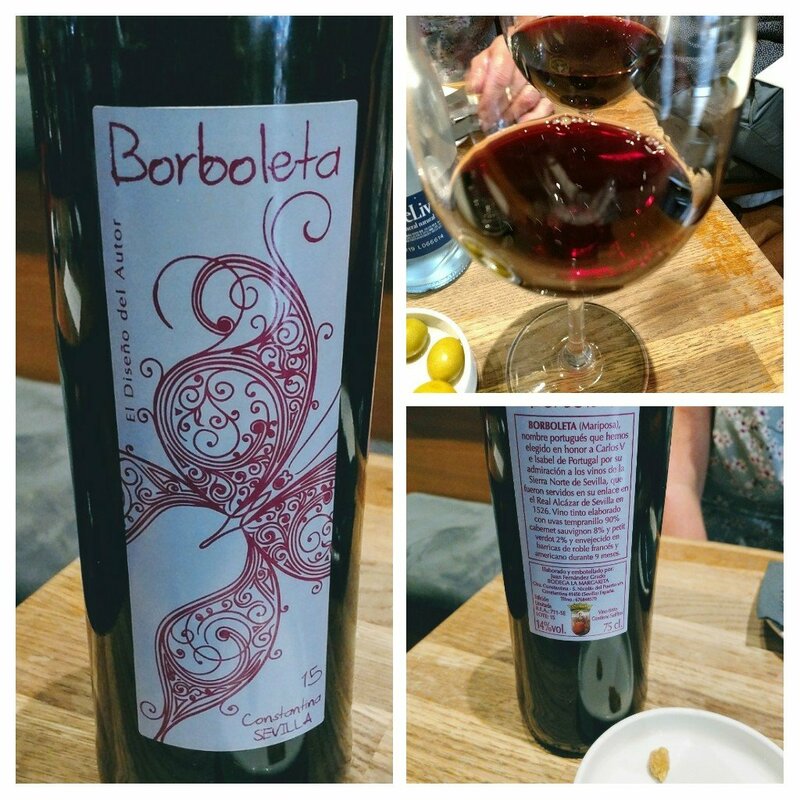 We had a bottle of a rather charming Sevilla red number (a blend of tempranillo and syrah – €17), which went down a treat with my albóndigas (the meatballs). Nice place, especially if you are looking for something a bit more formal and where pointy elbows are not required. Another old school bar this one, which was seemingly popular with all ages. 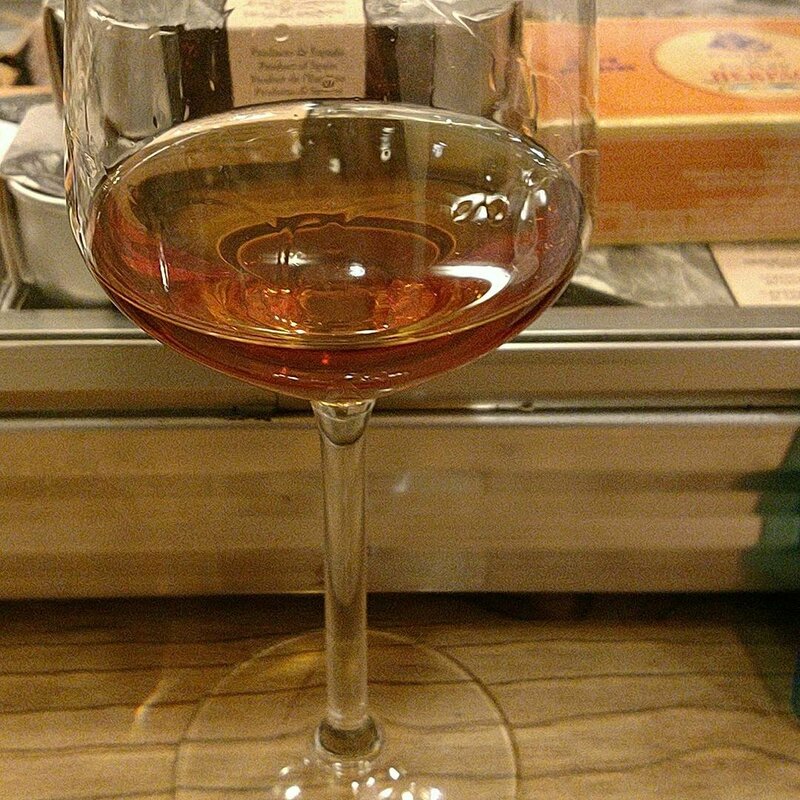 They also had a really good selection of sherries and wines. 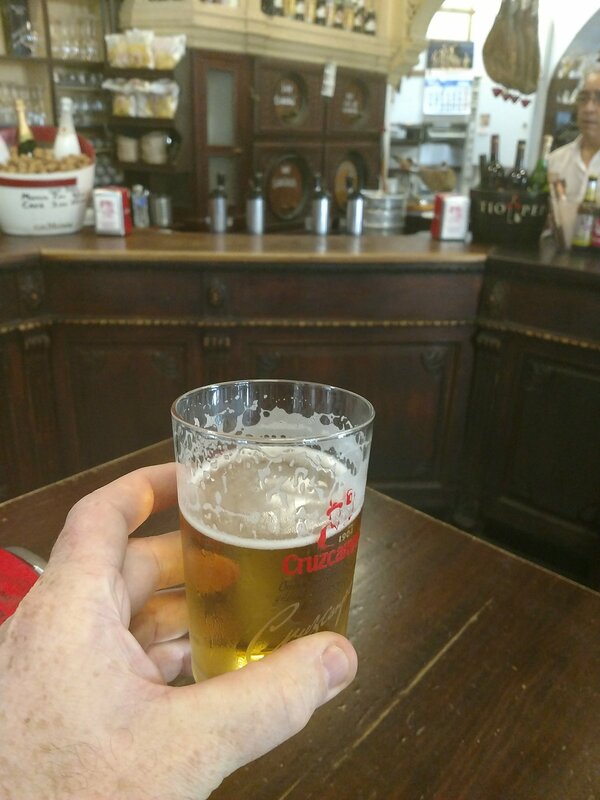 When it is busy (usually) you have to be quite pushy at the bar to get served here (it tends to get quite manic with people jostling for the attention of the bar staff who work at a million miles an hour). I caught on fairly quickly, but another British couple failed to twig and I watched them (politely – them not me) wait for an eon to get served as everyone around them pushed in and shouted out their orders. 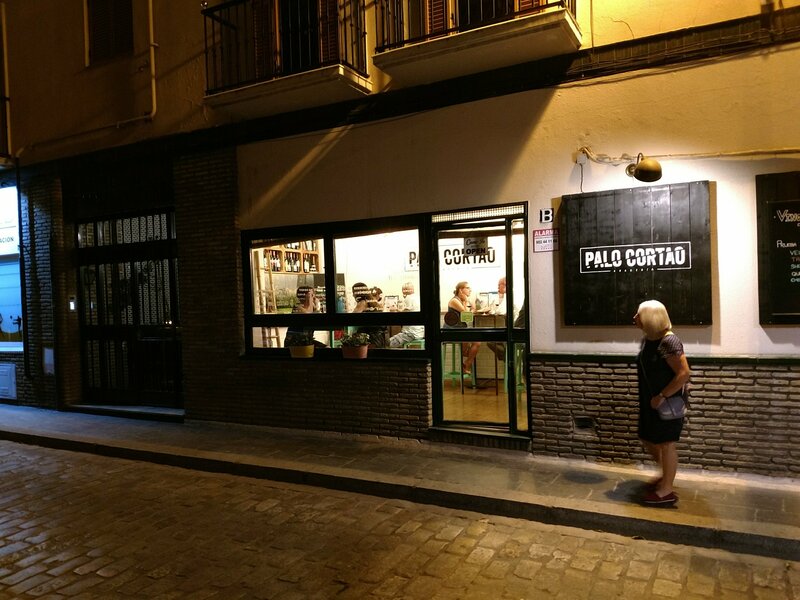 Had to put this one in (although Mrs. SF wasn’t that keen) as it is viewed as the original tapas bar that kicked it all off. Bit out of the very centre, it was madly busy and very noisy. 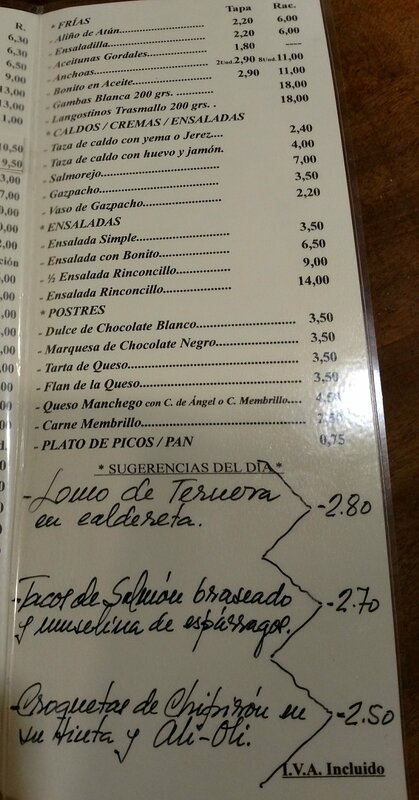 As such my rubbish Spanish led to confusion in terms of ordering and knocked into touch anything complex. 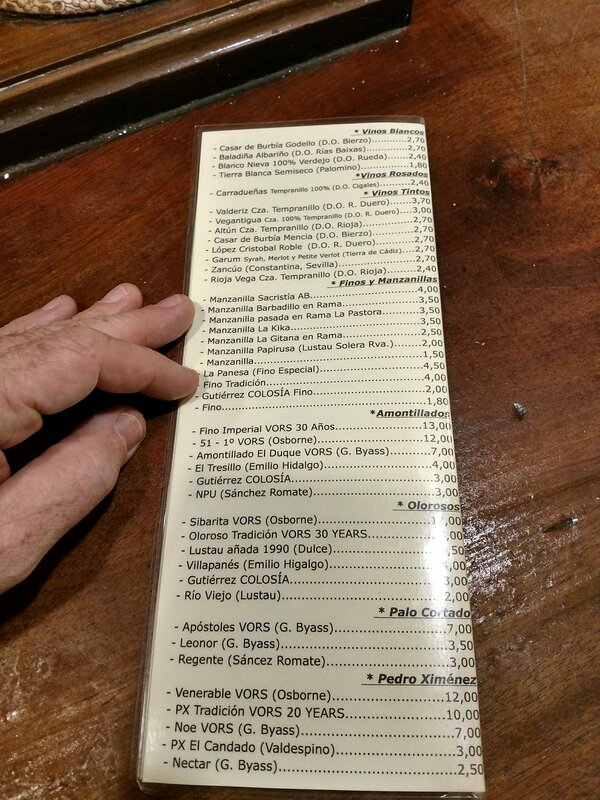 It had a fabulous list of top quality sherries at very reasonable prices starting at €1.50 for a standard manzanilla and going up to €13 for a Fino Imperial VORs amontillado. 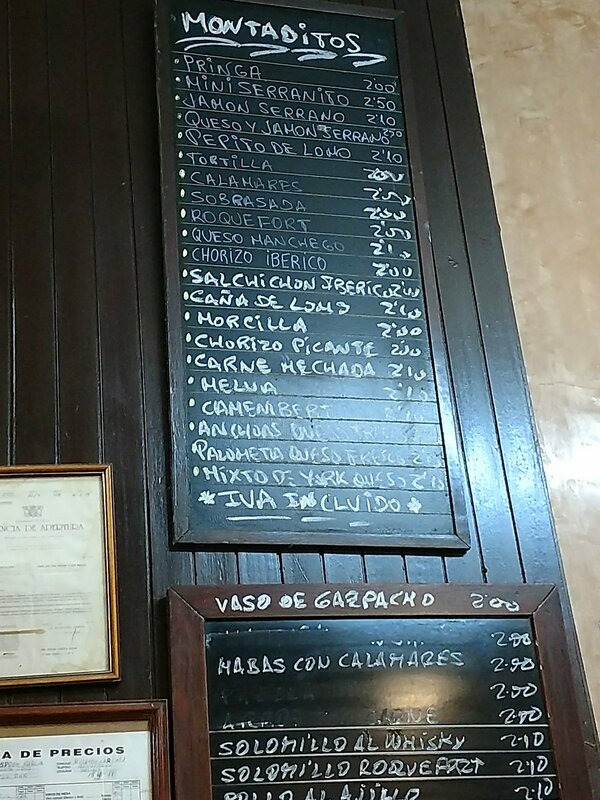 Nice selection of reds also, with Garum (a very nice drop from Cadiz) nicely priced at €2.70 a glass. 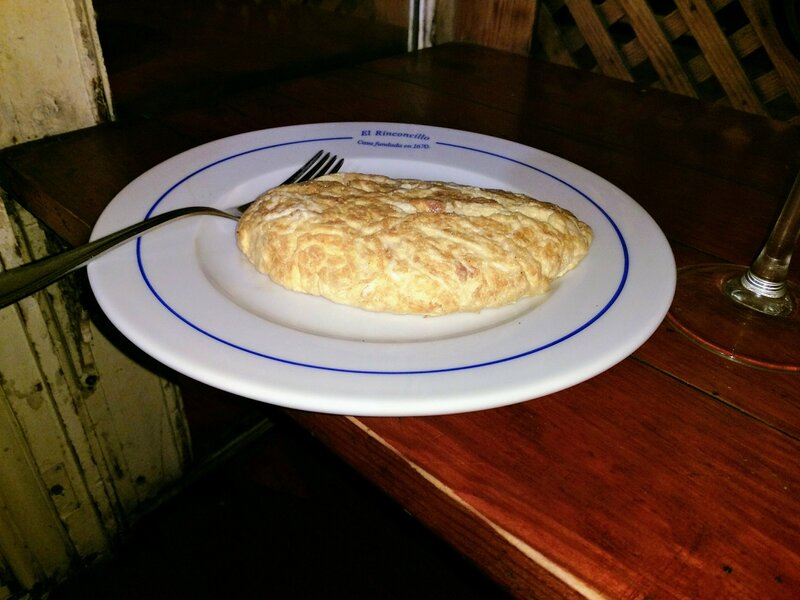 but as it was rammed communication issues (my fault for having truly rubbish Spanish) meant I decided on to go relatively simple in the form of a omelette tortilla de queso manchego. 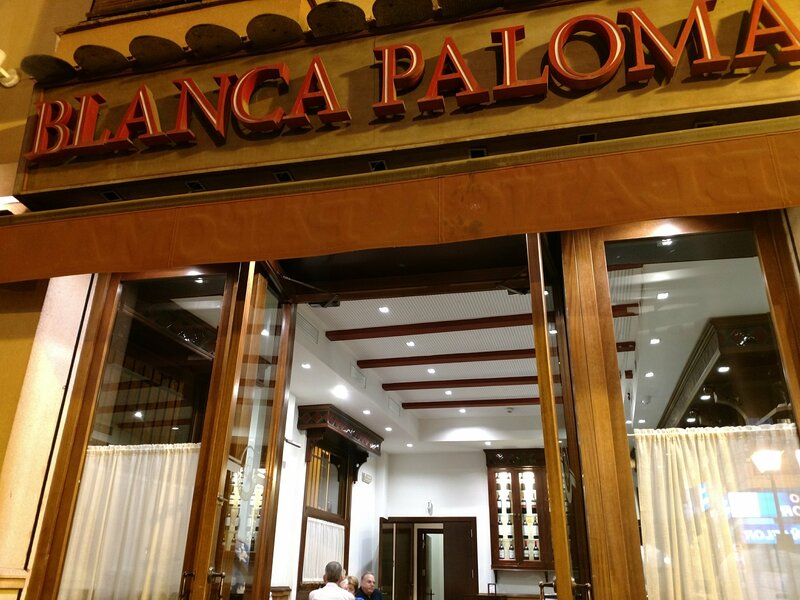 Across the river in the lovely Triana area of Sevilla is a small but decent enough tapas bar in the form of Blanco Paloma. 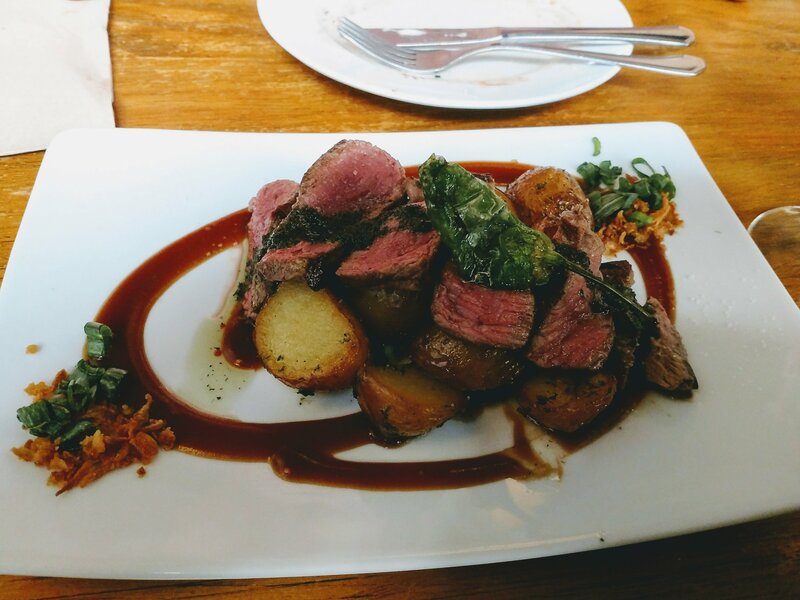 Good food and personable service made this a very pleasant pit stop of an evening after we strolled across the river. 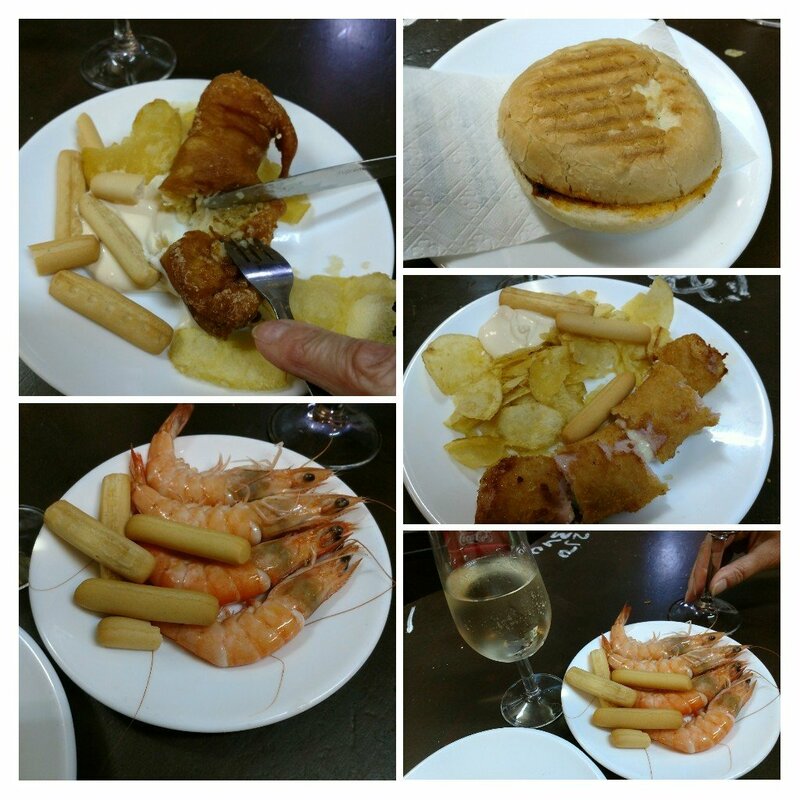 Good food and portion sizes, wih tapas of salmorego (€2.50), solomilo a la pimienta (€2 50) and a demi ración of croquetas de cabarineros (€7.50) impressing. 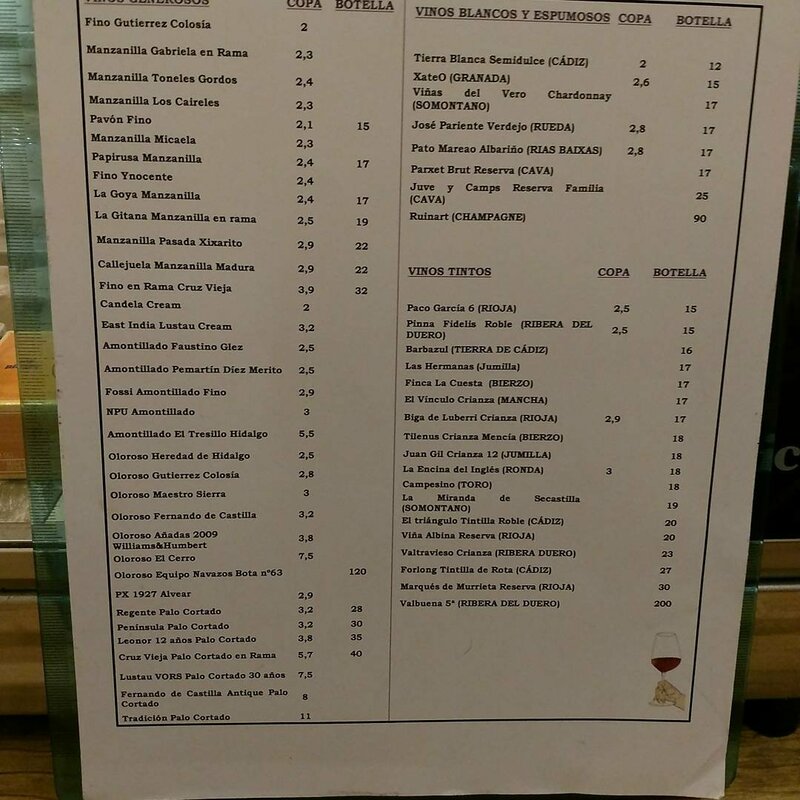 The wines on offer are good and nicely priced (bar from the Mugas which always seem to be expensive, comparitively speaking, in Spain). 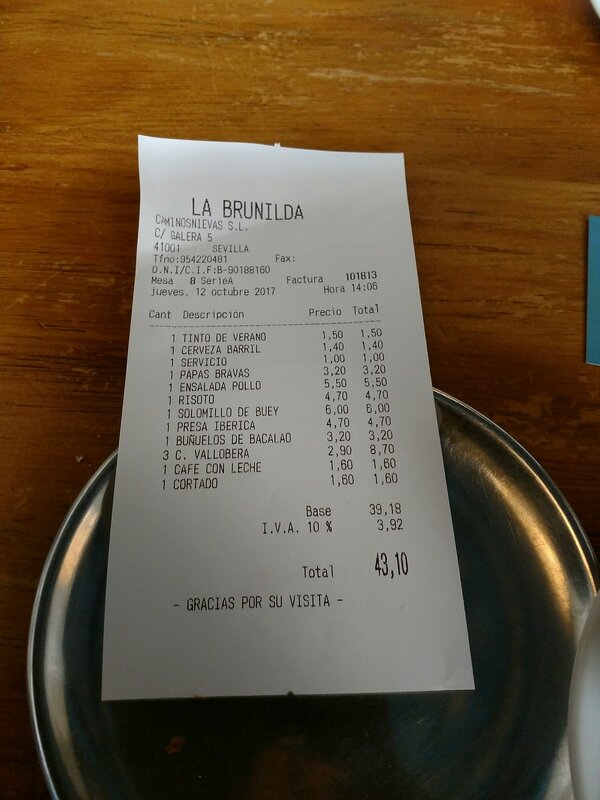 We had, with our food, a few glasses of Ramon Bilbao rioja (€2.75 for a generous pour). 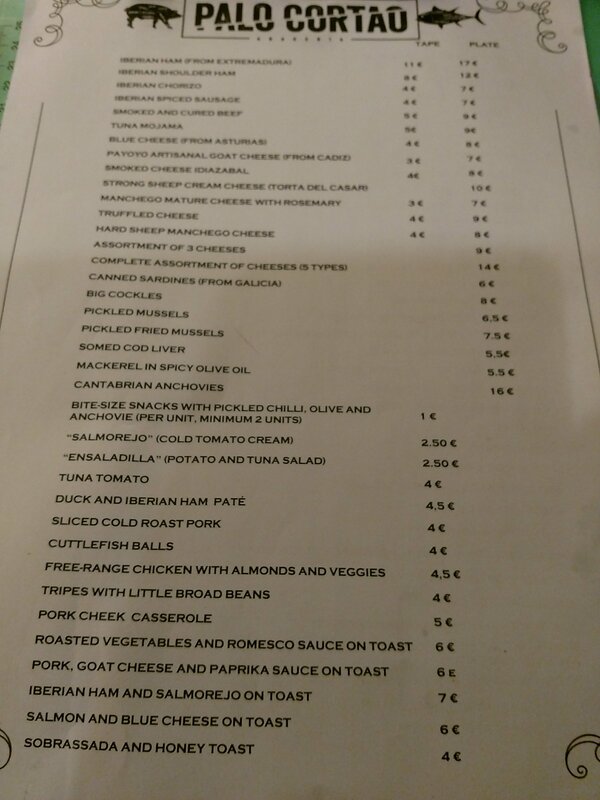 Nothing fancy, but good honest tapas at a fair price. 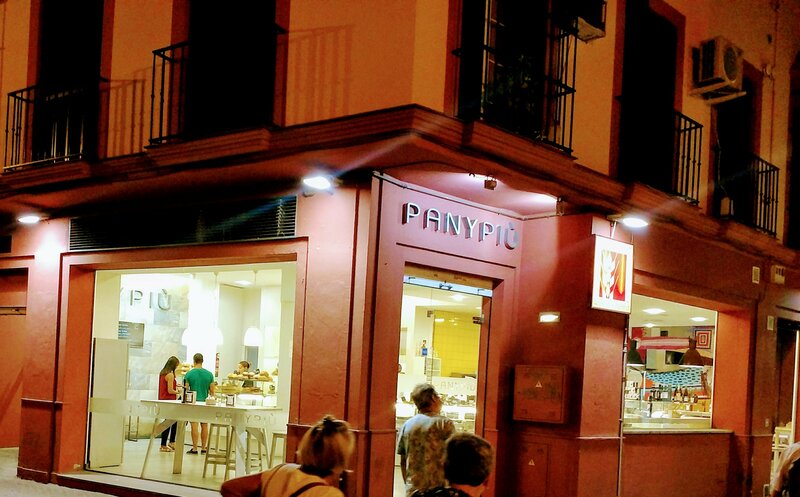 Not a tapas bar, but as we were in an apartment it became our go to breakfast place. Very good coffee and orange juice is also to be had here. Be warned it gets very busy, as it was seemed popular with both locals and tourists. 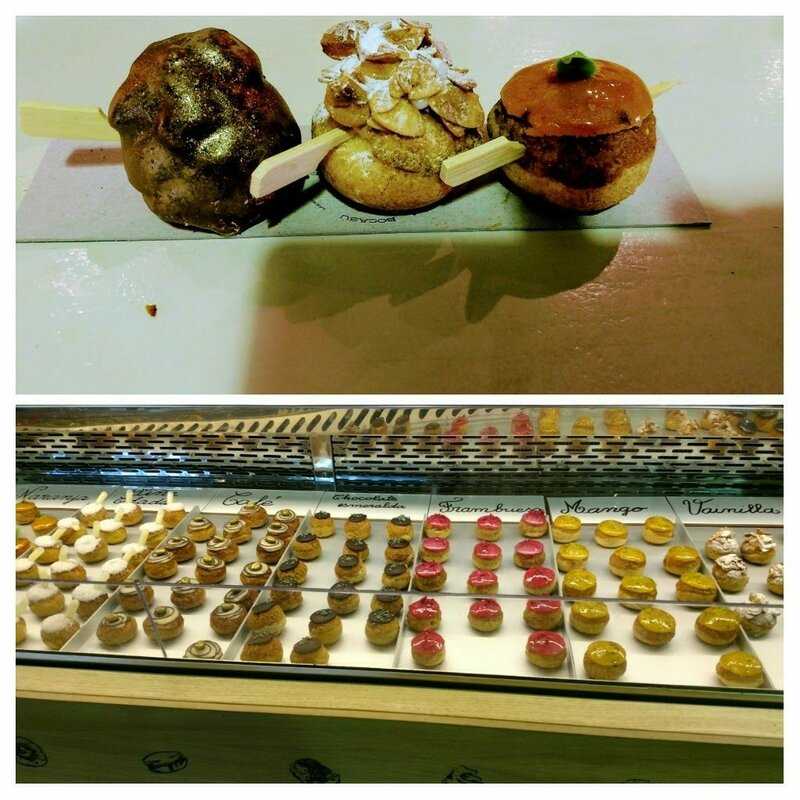 Another non tapas place, this delightful bakery stall in the Mercado de Triana delivered up some wonderful sweet treats. 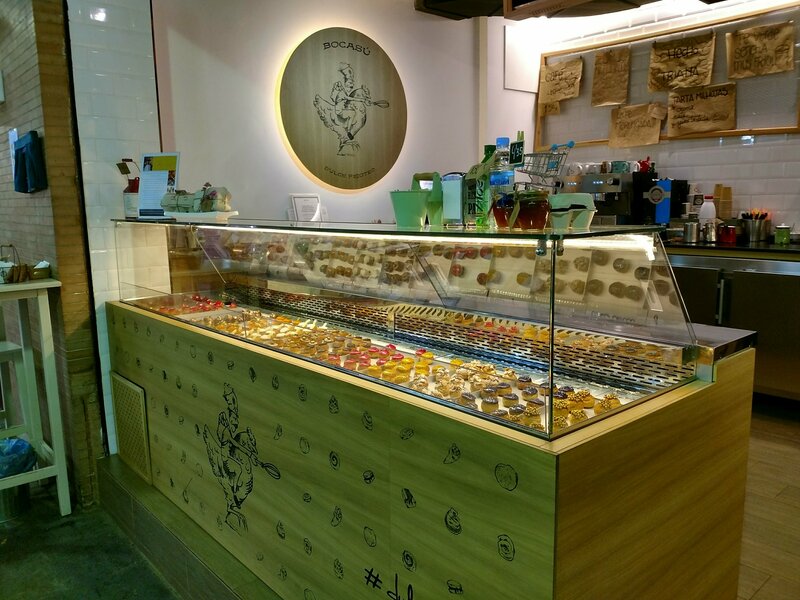 Definately one to visit if you have a sweet tooth, with flavours to meet all tastes. Good coffee was also on offer. 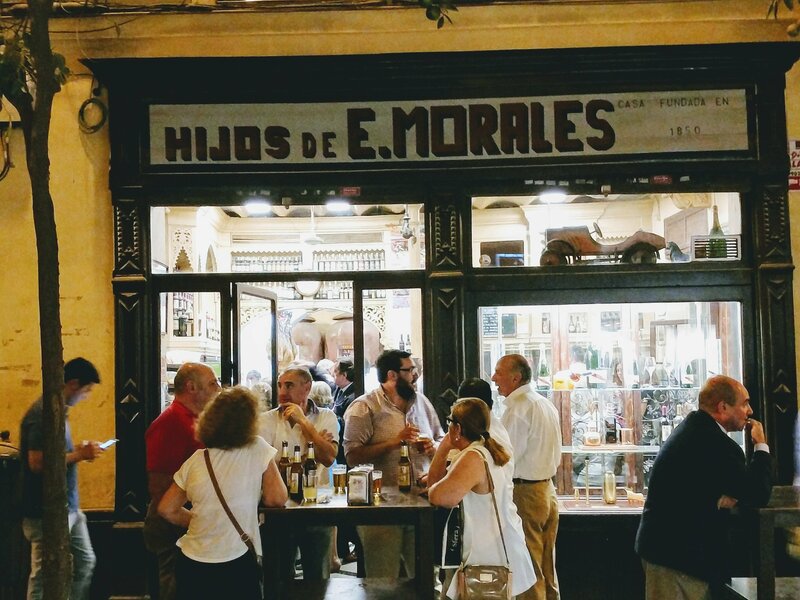 Sevilla is a stunning city and a must visit destination for food and culture lovers. 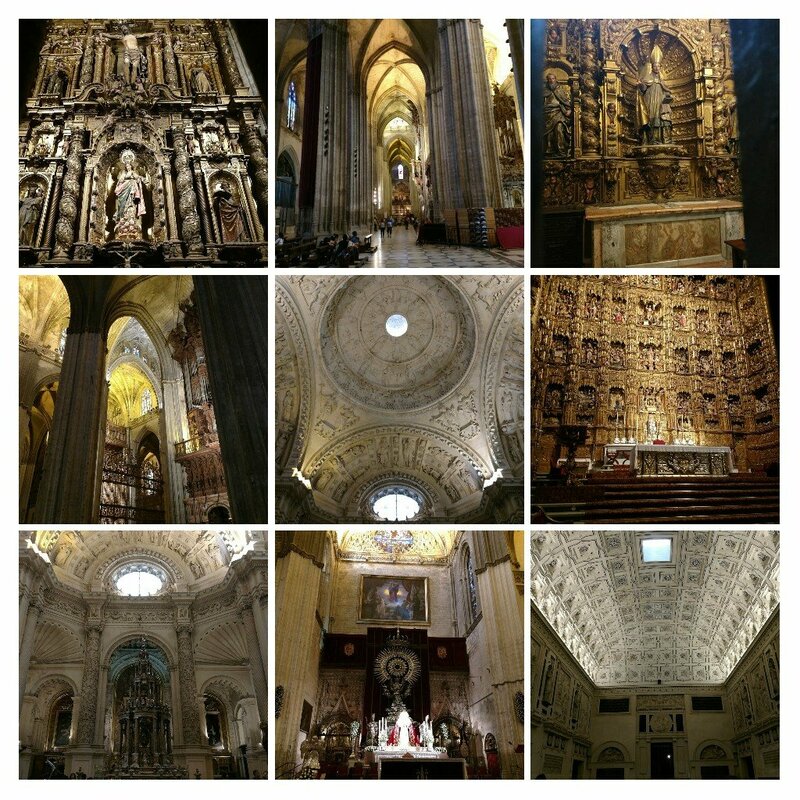 For a Spring or Autumn break (Summer there is way too hot for me), I can hearty recommend Sevilla (perhaps tacking on side trips to Jerez and /or Cadiz which are easy by train – we did the latter on this trip and visited Jerez the year before). 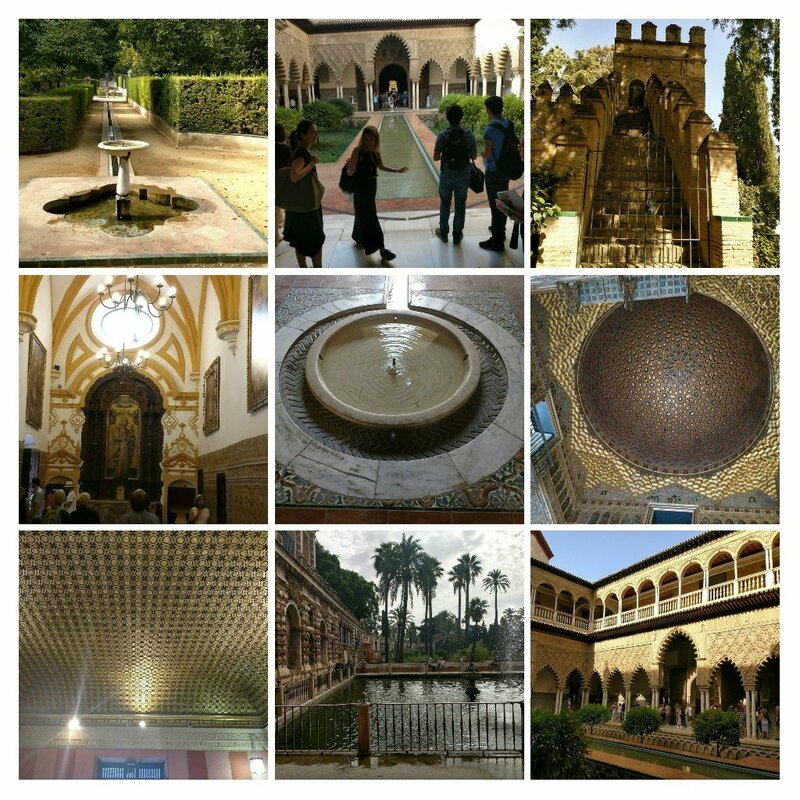 and the Real Alcazar is a moorish marvel with beautiful buildings and a wonderfully relaxing garden, which seemed to be immune from the blistering heat outside (make sure you buy a ticket in advance for these, if possible, as queues for both can be long). 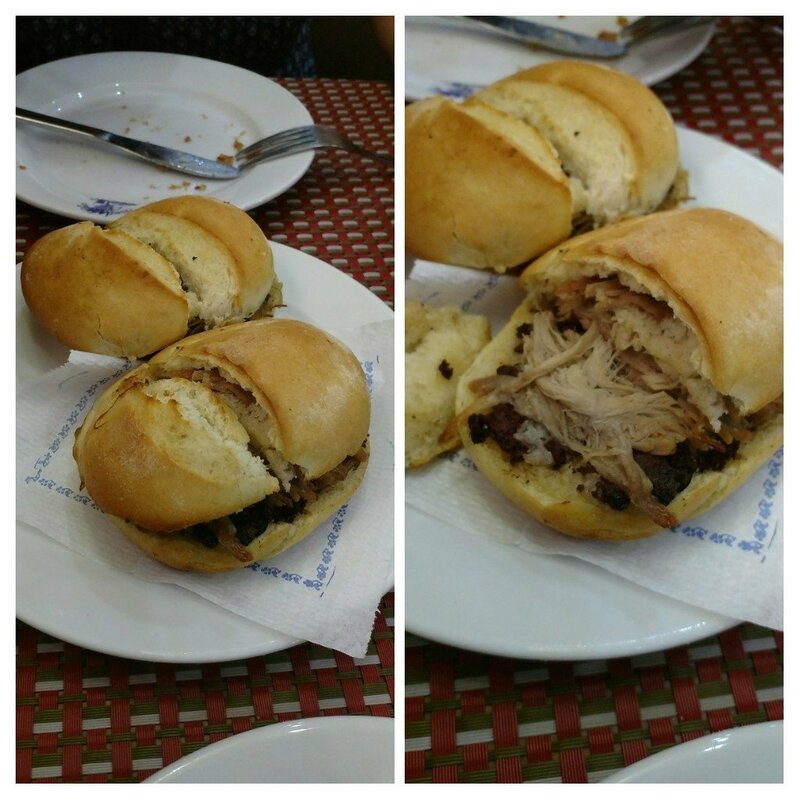 There are many other delightful sights in Sevilla and plenty to do bar from stuffing your face. 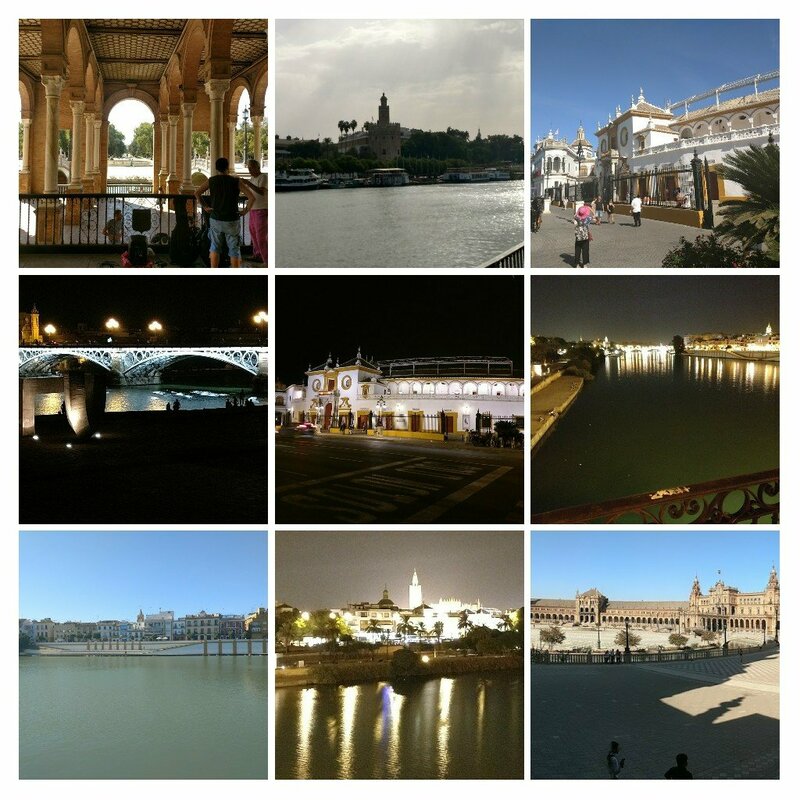 It is no surprise to me that Sevilla was name Lonely Planet’s top city break destination for 2018. 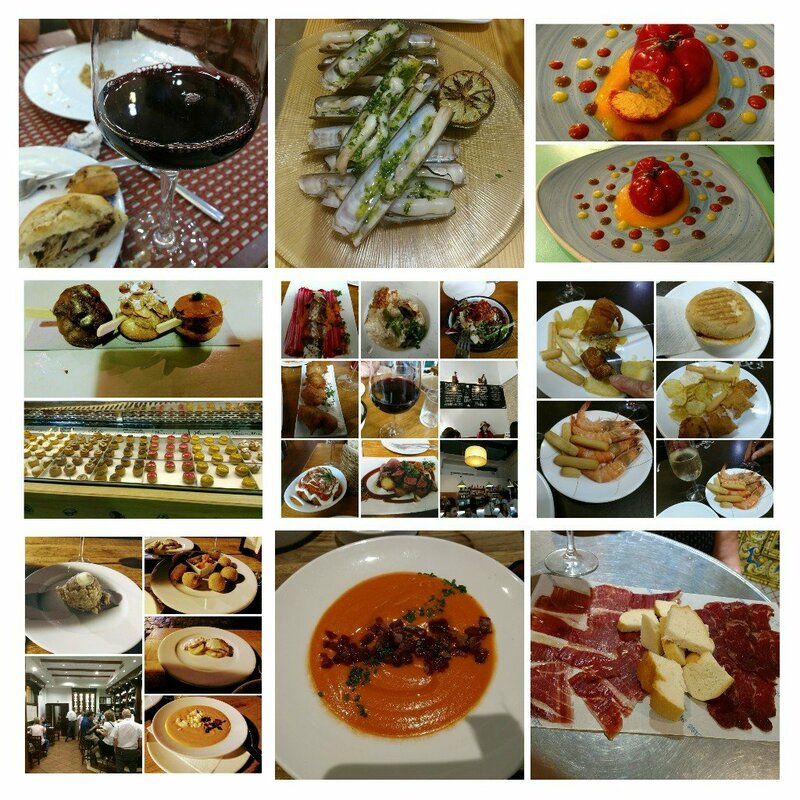 Food wise we didn’t have a bad meal and it certainly comes close to rivalling Donostia San Sebastián on the quick eats/bar hopping front (if not the Michelin star, sit down, gaffs). Bar hopping here is awesome, with fantastic food and booze to be had and a jaw dropping number of bars to visit, but with so much choice (and it being such a popular destination) it has its fair share of tourist traps. 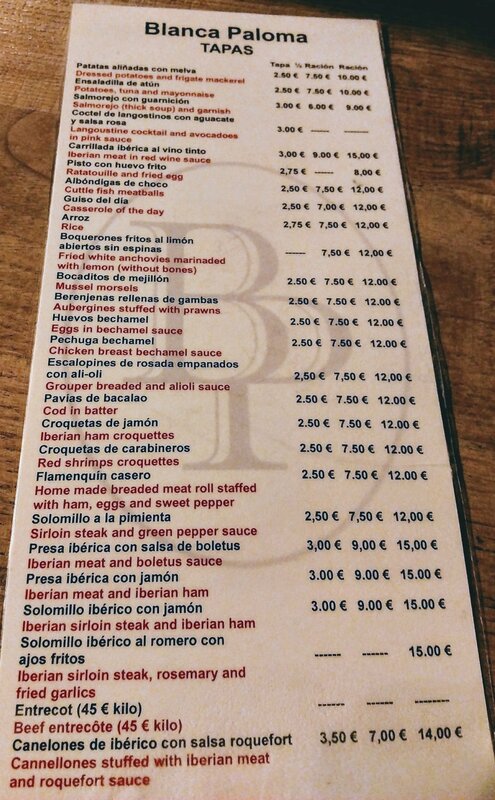 It can all be a bit daunting (especially if you have no Spanish) in terms of where to go, ordering (at the bar it is often a bit of a scrum) etc. 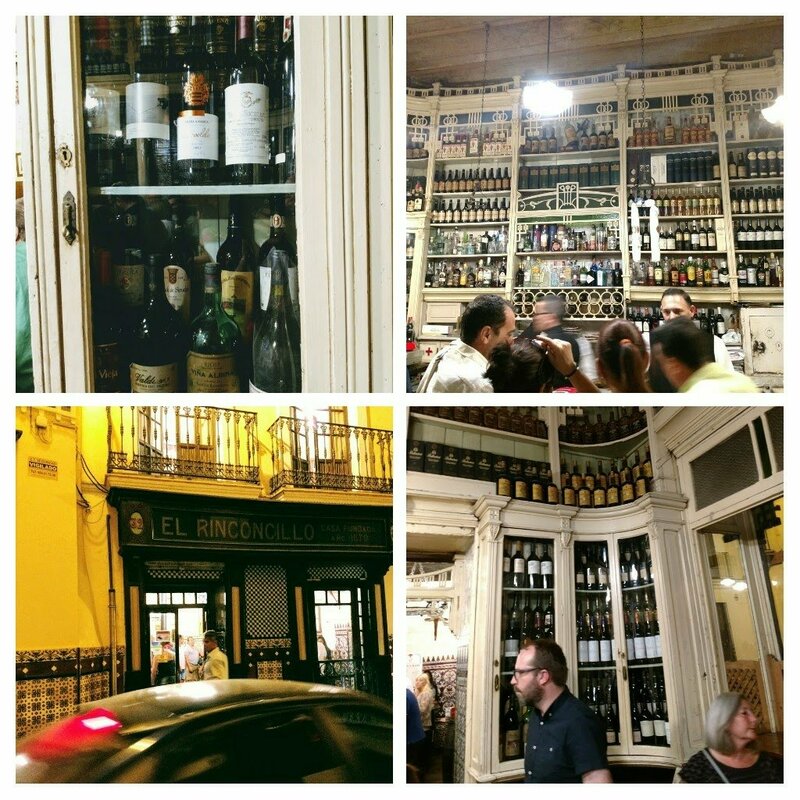 If you are looking for a good guide Shawn Hennessy’s Sevilla tapas tours (the linked website had details of loads of Sevilla’s tapas bars on it) is certainly a good place to start. Would I go back? 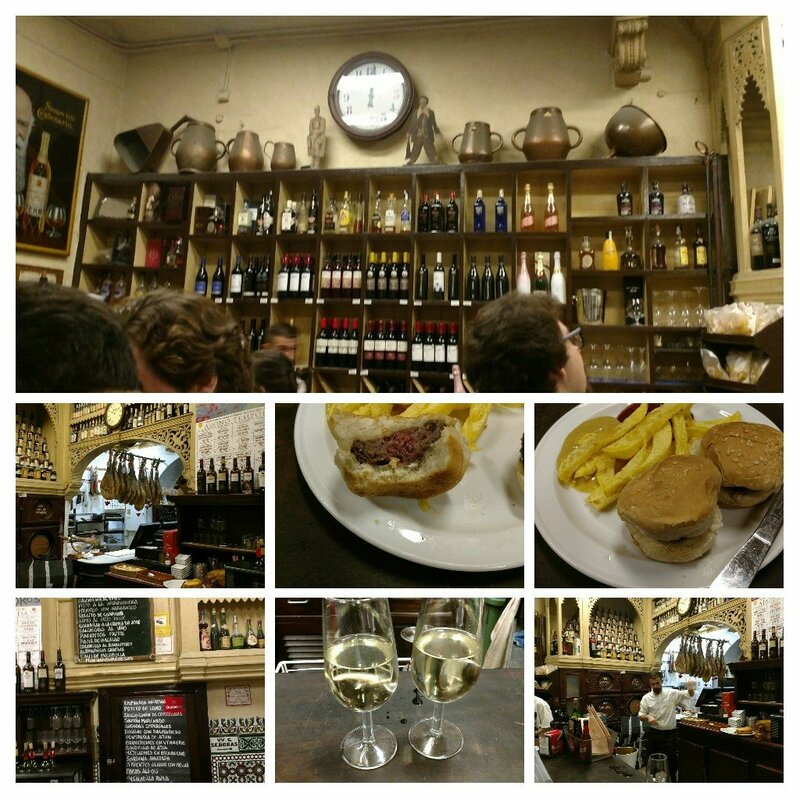 Absolutely, fabulous city and a must visit for fans of Spanish food, drink and culture. 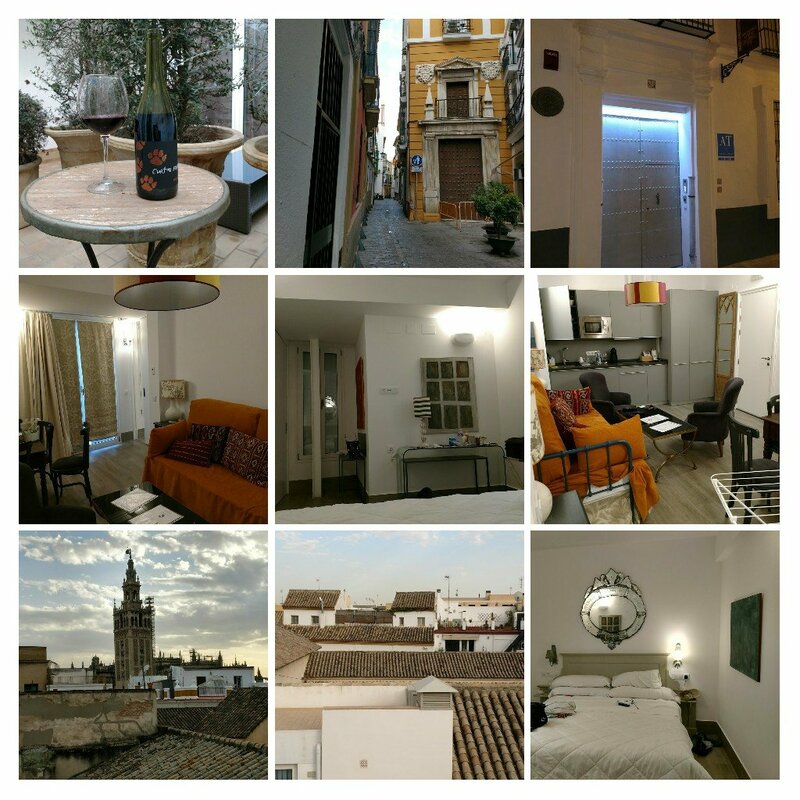 We flew directly to Sevilla from Gatwick (an alternative is to fly from Cardiff or Bristol to Malaga and get the train) and stayed in the very pleasant Overland Suites (very nice, big apartment, good location and the added and unusual bonus for an apartment of a really good conceige). I also understand from June 2018 EasyJet are flying direct to Sevilla from Bristol This is excellent news as that makes not only Sevilla, but also Jerez and Cadiz far more accessible to us out West. 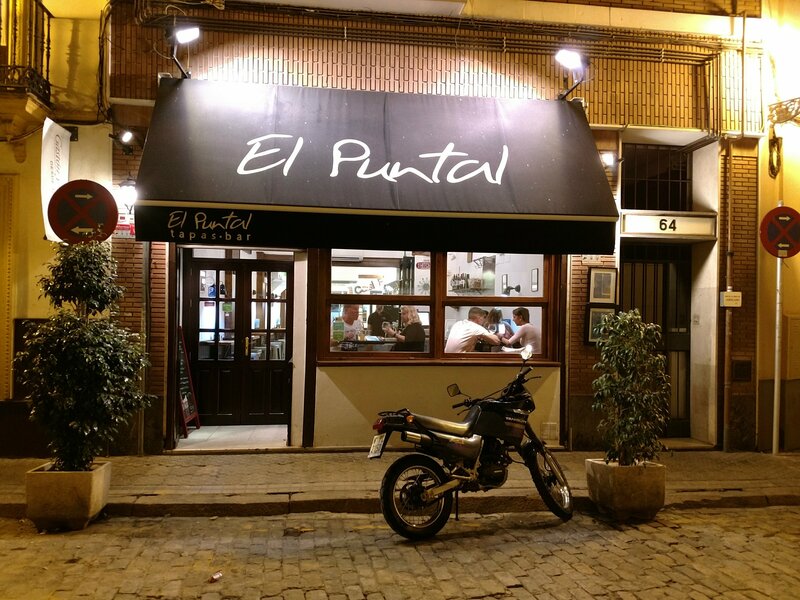 I would certainly recommend this place to anyone looking for somewhere to stay in Sevilla. 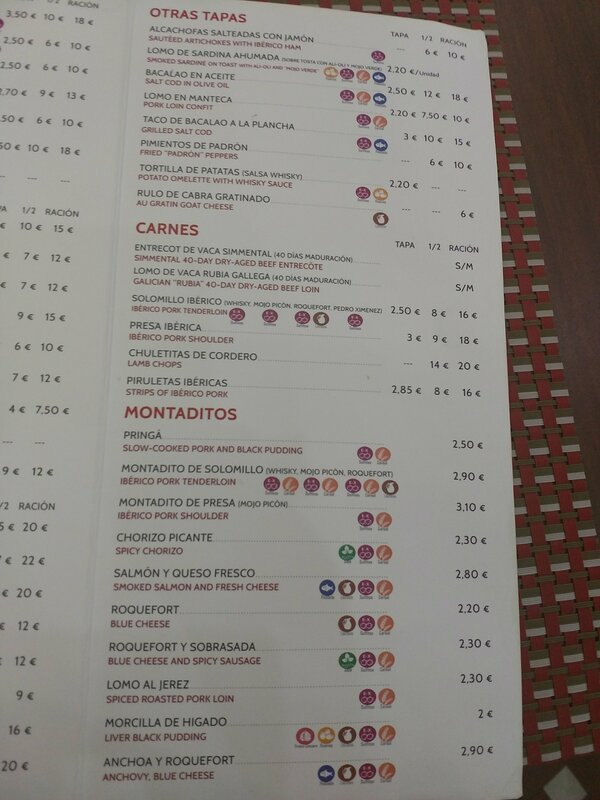 Would certainly stay there when I next visit Sevilla. 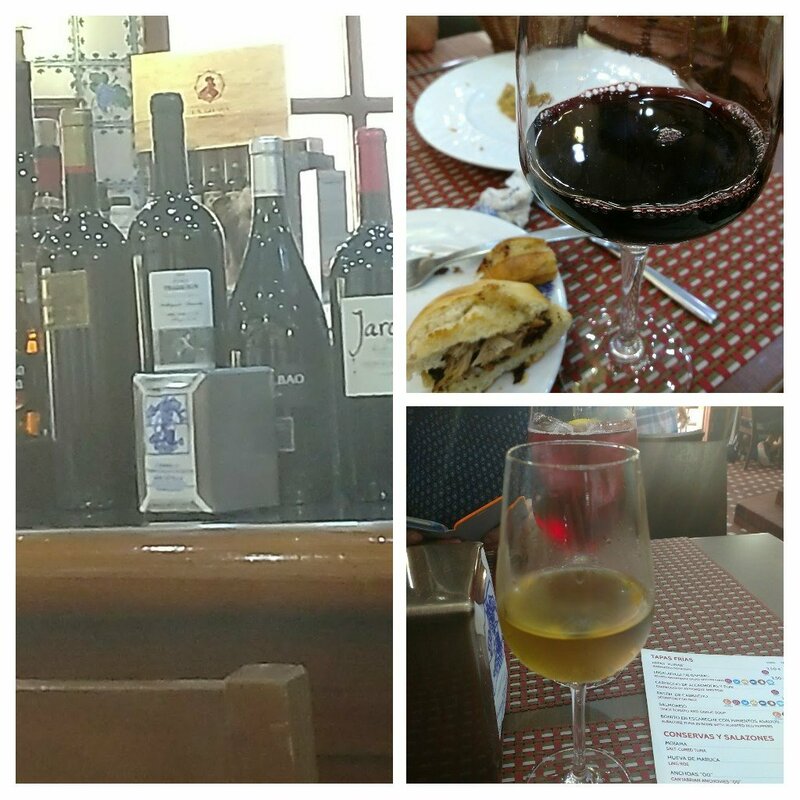 This entry was posted on Jan 7, 2018 by solicitingflavours in Alcoholic drink, Andalucia, Andulucian wine, Barbecue, beef, Burger, Cadiz, cafe, cheese, coffee, Drink, Dry white wine, eating out in Sevilla, fino, Food, Food and wine products, Galcian white wine, galician white, Gonzalez Byass, Jerez, La Rioja Alta, Lunch, lunchtime, manzanilla, meatballs, Oloroso, palo cortado, pintxos, Pork, Priorat, Red Wine, restaurant review, retail, review, Ribera del Duero, Rioja, salad, San Sebastian, Sanlucar de Barrameda, seafood, sevilla, Sevilla tapas bars, seville, Sherry, Spain, Spanish wine, Tapas, Tapas bar, Uncategorized, Verdejo, White wine, Wine, wine mark up, wine pairing, wine pairings.